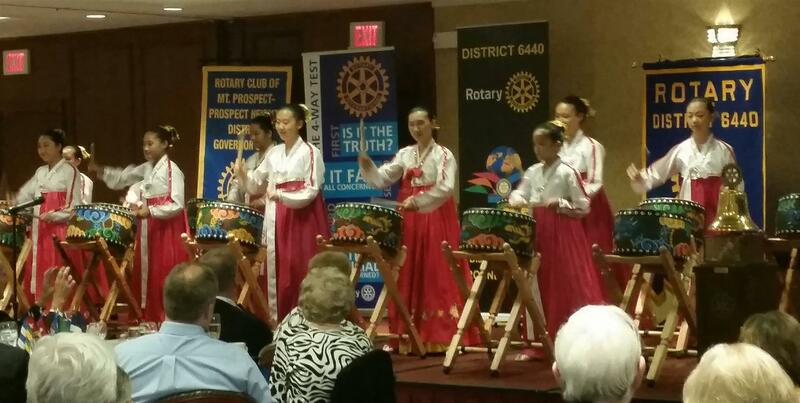 We are in the process of merging with the next door Rotary Club, the Mount Prospect/Prospect Heights Rotary Club, to form a larger club with even more projects, social events, and service opportunities! 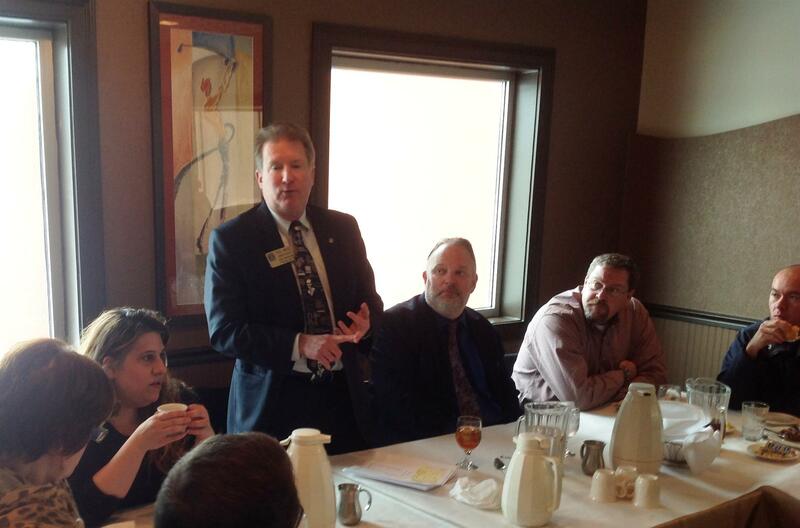 Our new meeting schedule is the second and fourth MONDAY of the month at Bar Louie in Mount Prospect, at 12:15. They have a delicious menu and a private space, perfect for our regular speakers. We will also have regular fellowship evening meetings on the first and third Monday of the month. We'll be visiting different area restaurants, so watch your email for details. 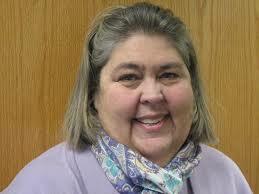 Mary Kate is the new Regional Executive Director of the Presence/Amita Holy Family Foundation. While Presence Health has always had a robust foundation funding activities across the country, this is the first time that Holy Family will have its own foundation targeted to Des Plaines community health projects. The first project on Mary's to do list is the completion and promotion of the Keys to Recovery Alcohol and Drug Rehab Center, a $2 million dollar project. The "Keys" project has a very special service at its heart; the Law Enforcement Assistance Program (LEAP). Police officers and other first responders have a truly difficult set of circumstances that put them at risk - exposure to violence, stress, narcotics, and an entrenched culture that makes it very hard to ask for help of any kind. The new LEAP program has a strong connection with the Des Plaines Police Department to start, and will serve LEOs from around Chicagoland. You can call them 847.298.9355 day or night. 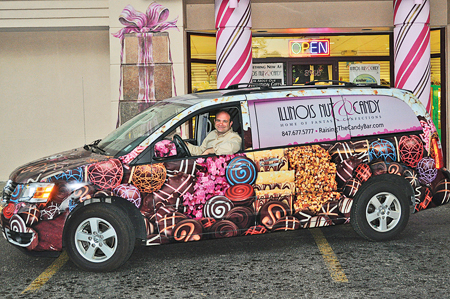 This is needed and exciting and we're proud to have it located in Des Plaines! Tim Costello, School Head of the remarkable Science and Arts Academy, gave us an inspiring and thoughtful summary of what a gifted school really is and everything it can do for its students. Children from 65 zip codes attend the SAA, which was established in Des Plaines twenty five years ago. 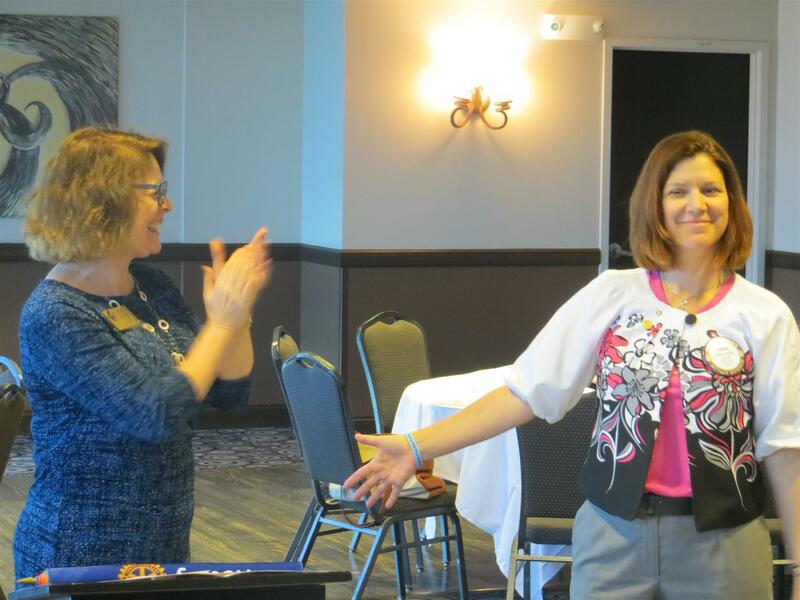 Nina Menis, Director of School Advancement, told us that the Rotary Club of Des Plaines played a big part of that early development (thanks Dave, Denny, Paul, and others!). We are supporting the school's Little Free Library, and we hope to be more involved in the school over the coming year. Thanks for visiting us, Tim and Nina! 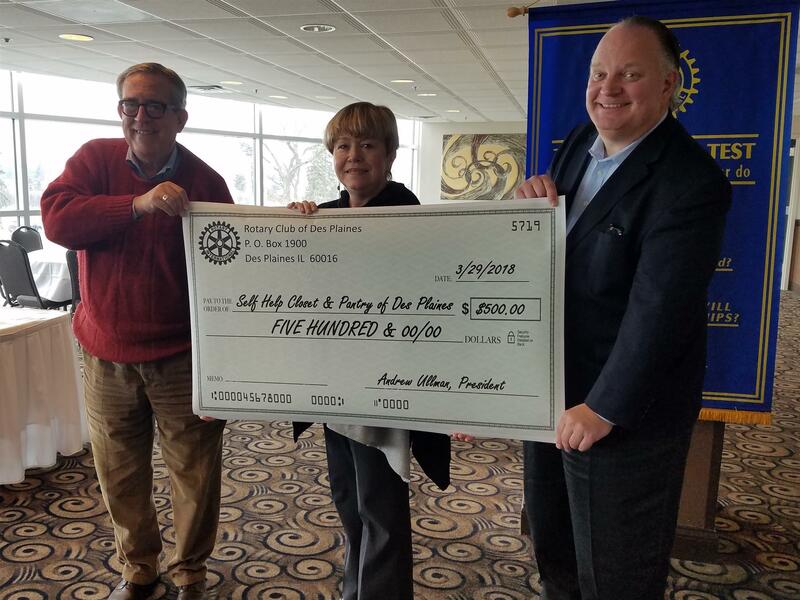 On March 29th, Steve Pokrak and George Schelter presented a check for $500 to Debra Walusiak, Executive Director of the Self-Help Closet & Pantry of Des Plaines. The Pantry supports hundreds of families and individuals who need a a little help meeting nutritional needs, a warm coat in cold weather, and even supplies like laundry detergent. The Pantry has been in Des Plaines since 1971, and their red donation barrels are a familiar sight around town. Debbie is the Pantry's ONLY paid employee, and the organization relies on regular volunteers to collect food from the over 50 red barrel sites, stock the pantry, and serve their guests. We are so glad we could make a contribution to such an generous and valuable organization! They led the competition from the beginning and finished with 52 points out of 80 in a challenging evening! We all had a great time and raised almost $3,000 for our club. Thanks to everyone who joined us and we plan on seeing you next year too. 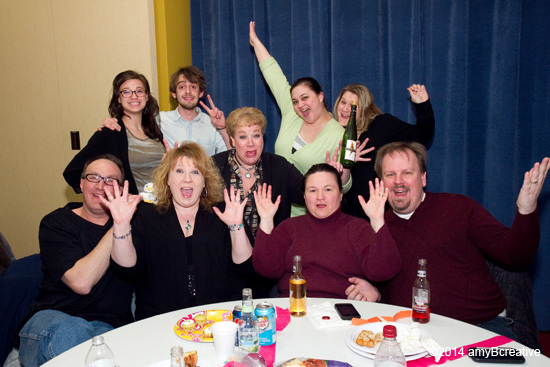 Mark Your Calendar for March 24th Trivia Night! Join us for our Sixth Annual Rotary Trivia Night at the Frisbie Senior Center! The buffet opens at 6:30 and the games begin at 7 p.m. As usual, this event is BYOB. Our 2018 theme is GAMES: video, board, Olympic, gladiators, you name it! And how about these cheerful folks! Join us for our annual service of Thanksgiving Lunch at the Frisbie Senior Center on Thursday, November 16th. This fun event will take the place of our regular lunch meeting at Club Casa. Meet us at the Frisbie at 11 a.m. We will serve everyone and then have a delicious turkey dinner with the attendees. Every Tuesday should be as cheerful as our third Annual Tomatina dinner at Via Roma Restaurant. Thanks again to Lisa and Chef Alessandro for such a warm and lively evening with such delicious food. and mille grazie to our sponsors, Millennium Bank, Village Bank and Trust, and WineStyles of Park Ridge. We learned a lot about services to the elderly in our community when John McNabola, Executive Director of the Center of Concern, visited us today. The Center of Concern has long focused on meeting the needs of seniors, whether it is a lack of social interaction, nutritious meals, affordable housing, or help to stay in their own home. This summer, they are offering a daily lunch to anyone over 60, at no charge. The hot lunch is served at the Des Plaines Public Library every week day at 11:30. The Center will also offer seniors conversation, entertainment, and some easy-going education over the course of the six month meal program. Our club was happy to donate $200 to the Center of Concern to help support their efforts. 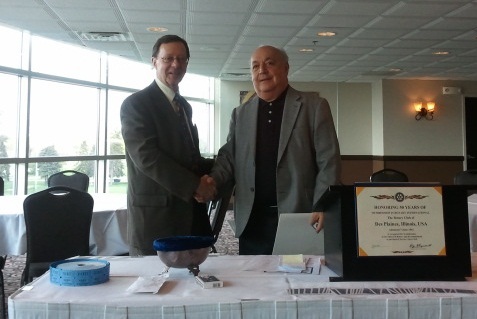 Below, President Steve Pokrak presents the check to John McNabola. CypherCon 2.0 is a vibrant Wisconsin Hacker Conference held at Milwaukee’s Discovery World. The event is open to anyone interested in exploring and manipulating new technologies. This year's CypherCon 2.0 was literally flooded by visitors young and old. Not only from the Midwest, but people from coast to coast, including many visitors from foreign lands. Hackers were showcasing their security skills in an enlightening environment. CypherCon 2.0 showcases electronics, wireless hacking, lock picking, safe cracking, cryptography puzzles, hardware hacking, biotechnologies, hacker history, and over twenty trusted speakers. 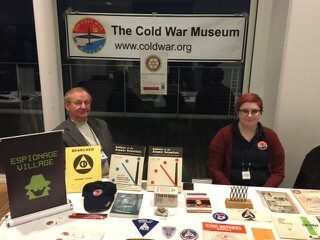 The Cold War Museum - Midwest Chapter - was present with an information booth. The Midwest Chapter's historical aim is to educate the public on U. S. history and is supported in part by the Rotary Club of Des Plaines, Illinois. Werner staffs the booth - ask him about Espionage Village! Christ Sturdevant and friends were also there. It is usually a happy thing to celebrate someone's retirement, but in this case we are even more cheerful because we are not losing George Schelter as a member of our club. We plied George with dessert (three kinds!) and told stories about our friendship at lunch today. In his honor, we donated $100 to the Trinity Lutheran Fine Arts Series (George's congregation for many years) and presented the man himself with a gift certificate to Via Roma. We look forward to many MORE years celebrating with George! From the left, that's Steve Samuelson, new member Aksana Sherman, and President Steve Pokrak. Sharon Lynch and Gloria Ludwig also stepped up to greet our neighbors at Sam's Club. We saw multiple twenties go in the bucket this year! We will be serving Thanksgiving lunch at the Frisbie Center on November 16th. It's early this year, so don't forget! Then we'll gather at Manzo's for the annual Chamber of Commerce Holiday Luncheon On December 8th. Rotary has a table, so let Steve know if you plan to attend. Harvey Mysel, founder of the Living Kidney Donor Network, spoke eloquently to our club about the importance of keeping a watchful eye on our blood pressure. "Check it often, and don't ignore the high readings!" Harvey even brought a home use machine and gave us our readings to take with us. Controlling blood pressure is hugely effective against kidney disease; the medications are effective and inexpensive. Also important is the need for living kidney donors! One living donor can impact multiple lives, and there aren't nearly enough deceased donors. Did you know you can live a long, healthy life with only one kidney? Visit the Living Kidney Donor Network for more information, and stop by the Des Plaines Public Library when the city nurse is here to check YOUR blood pressure. 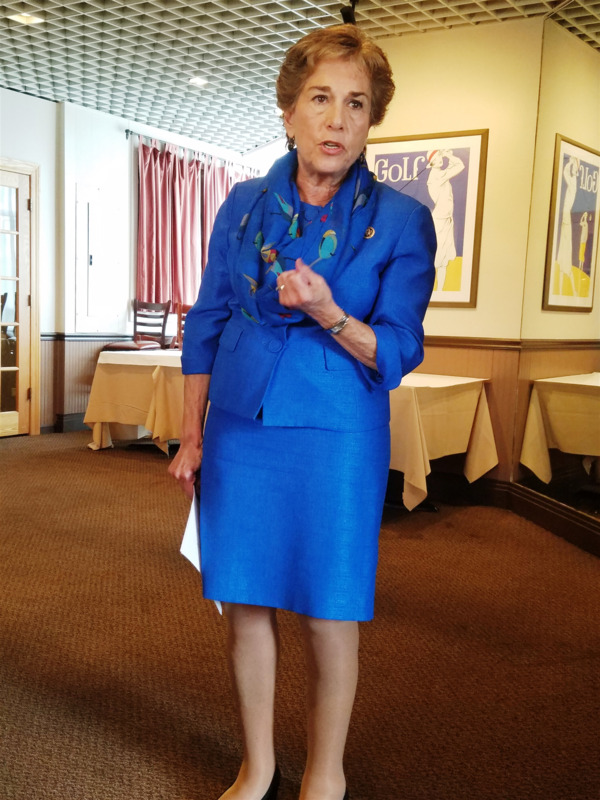 We were lucky to spend an hour with Representative Schakowsky at lunch two weeks ago. It's a particularly frenetic political season, and we had a large group of Rotarians eager to hear her opinions and goals. Our conversation ranged from the country's response to 9/11 to consumer product safety. Jan Schakowsky is a political veteran, and she knows how hard it is to get two sides with strong opinions to meet at all, let alone in a fruitful compromise. But her experience has also taught her that progress CAN and WILL be made. It's hard work like that that gives us all hope for our future. Don't forget, the Des Plaines Public Library is hosting two weeks of early voting starting October 24th, right up until Monday, November 7th. And the library can always register new voters, too! 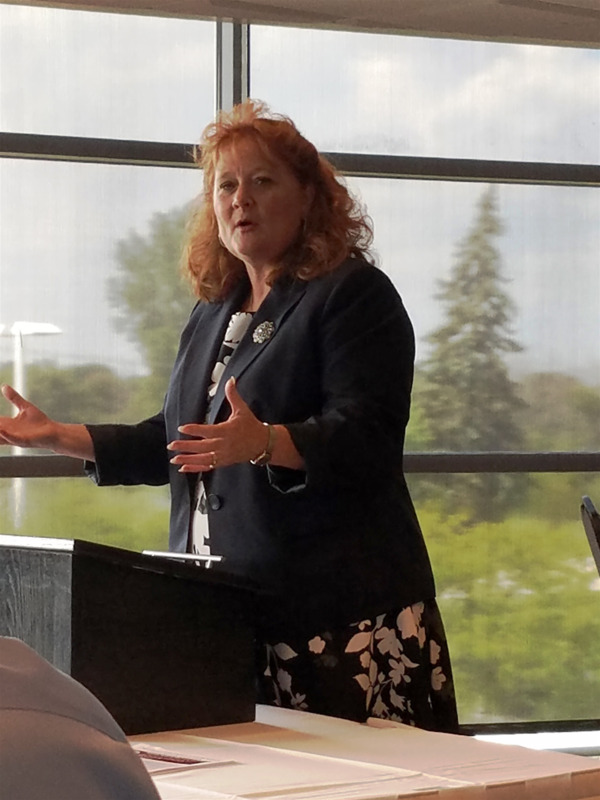 Illinois State Senator Laura Murphy joined us for lunch today, to talk about the state of Illinois governance in general, and what the next year may hold for residents. Senator Murphy serves the 28th District, an area that includes two counties and ten municipalities, from Rosemont west to Hanover Park. Laura's vocation and passion has always been higher education, as well as that major impediment to education, alcohol and substance abuse in young people. 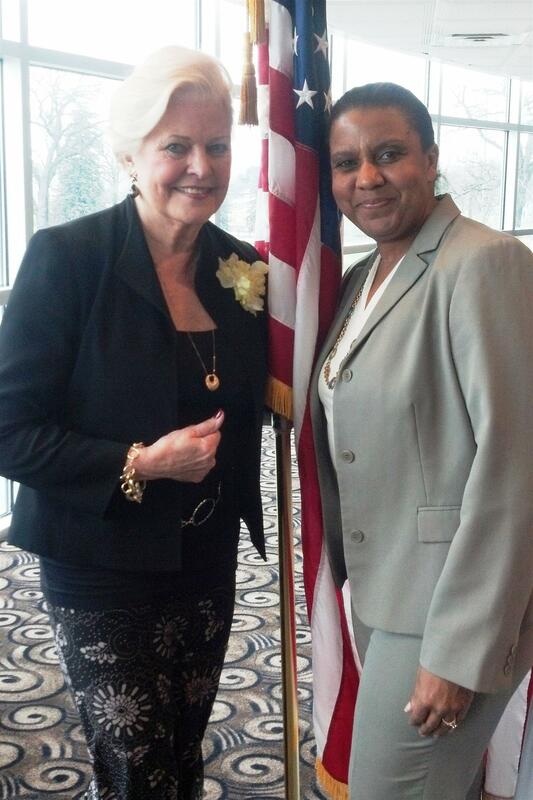 She has been a teacher, a Des Plaines alderman, and a member of the Illinois Liquor Control Commission. The Senator knows what a logjam Illinois government and finances are currently in, but she hopes that combining reform, mediation, and term limits will bring Illinois into a much better position. The state is rich in natural, business, and human resources, but of course politics and power don't always work to everyone's advantage. We had a great turnout to hear Senator Murphy, and we hope to see you all at future events too! Last week we were honored to host Marcelo Avila from the Quito Latitud Cero Rotary Club. We had worked to fundraise for earthquake relief in Ecuador - so many dead, so many more homeless, most of them the poorest residents - and were able to present Marcelo with $3,000 on May 12th. Mary Seat of Wisdom School, the Lake in the Hills Rotary Club, and the Willows Academy contributed significantly to this effort. If you were thinking about a trip to the Galapagos, plan your trip. You have friends in Ecuador! Below from left: Marcelo Avila, Andy Ullman from our club, and Judy Zoromski from Mary Seat of Wisdom. 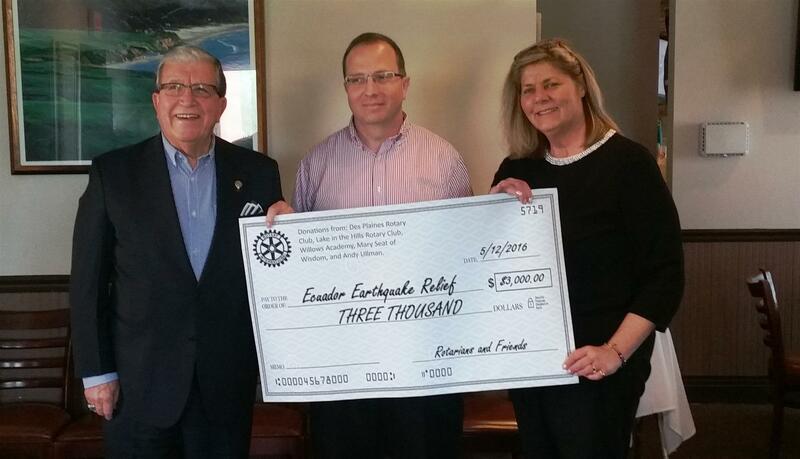 John Eilering from the Mount Prospect/Prospect Heights Rotary Club stopped by this week to present a check for $350 for our ongoing RefugeeOne fundraising project. We plan to work with a refugee family this spring, providing home goods, mentoring and general orientation to life in Illinois. Pictured below are John, Andy Ullman (our project organizer), and myself. THANK YOU AGAIN! Every year the Des Plaines Chamber of Commerce and Industry throws a glamorous party to raise money for its scholarship fund, and every year some of our club members spit shine their shoes and attend. This year about half of a dozen of us ate and drank and danced. Gloria won a gift basket of Ice Wine and bakery certificates, and I won two tickets to see Othello at Chicago Shakespeare Theater. 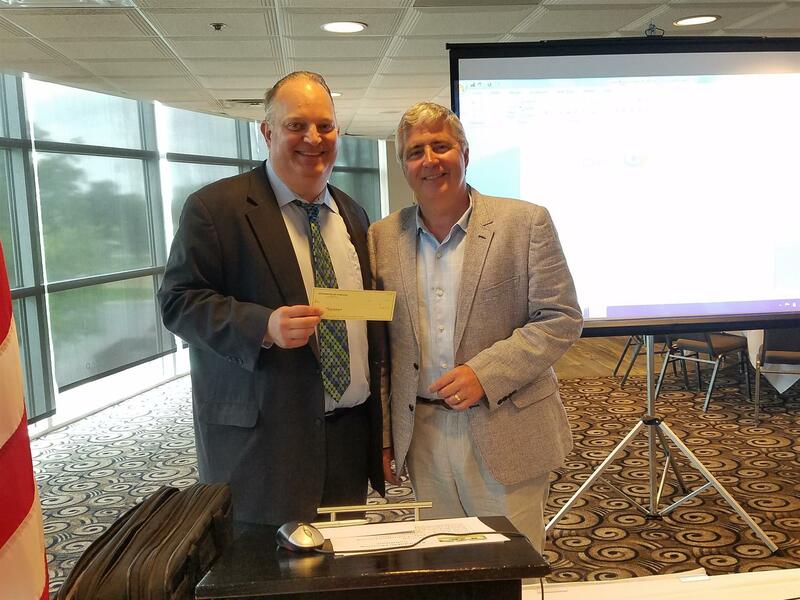 But the big winner of the night was Chris Sturdevant, our adjunct Rotarian from Wisconsin, who won a collection of gift cards worth over $500! 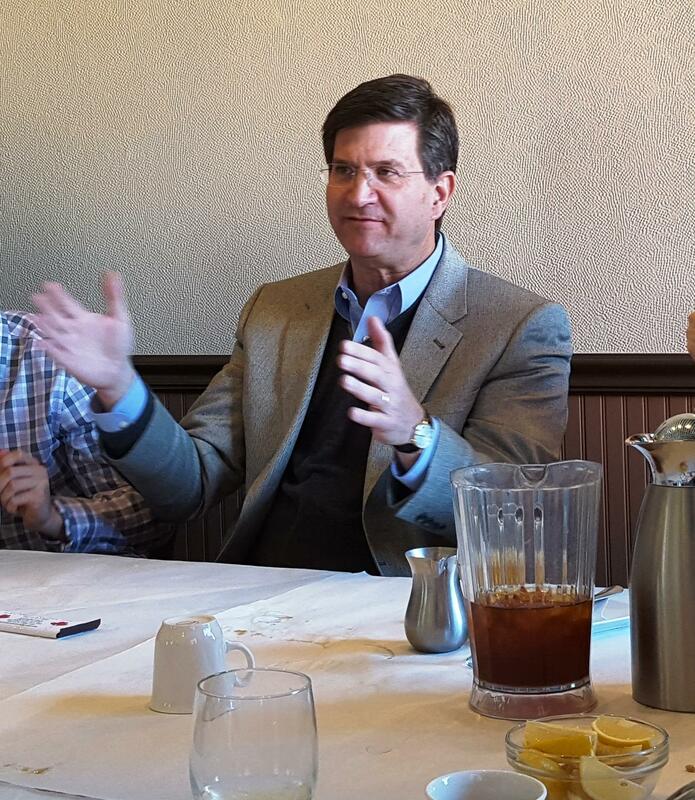 We had a lively, informal conversation with Brad Schneider this week over sandwiches and cheesecake, where we discussed immigration reform, the state of Illinois funds, the changing state of libraries, the future of health care, and much more. It was really stimulating, and Mr. Schneider is clearly knowledgeable and open to new ideas. Rotary is sponsoring the Chamber's monthly breakfast at Katie's Kitchen on Friday, Feb. 12th, from 7:30 to 9 a.m. Let Roberta or Steve know if you want to join us as we promote our club and our upcoming Trivia Night. We've had some wonderful speakers in the last few weeks! Maureen Staunton, Manager and Nurse Navigator at the Women's Imaging Center/Ultrasound at Presence Holy Family, came to talk to us about breast cancer and breast health. Maureen described their partnership with Silver Lining (the Alliance Foundation), which allows poor women to pursue treatment beyond the initial mammogram or other early intervention exam. One in eight women will be diagnosed with breast cancer, although survival rates are much higher than in past decades as a result of educating the public and early detection programs. Presence Holy Family's women's health center is a huge part of that effort. Barb Kimicata gave us a fascinating look at the question of Genetically Modified Organisms (GMOs) in our diet. Barb is a volunteer for Illinois Right to Know GMO, a nonprofit dedicated to education, legislation, and labeling of GMO foods. This organization is part of a nationwide alliance collecting research, articles and other information about the GMO industry. First, the difference between GMOs and hybrids. Breading crops and animals for better yields is centuries old, but GMOs are different. These organisms have had their genes "spliced", to introduce resistance to weed killers and pests, for example. Did you know that 94% of the soy we consume is genetically modified? There's a lot to learn! The library has many books and films on the subject so you can learn more. No meeting at Club Casa November 19th! Join us instead at the Frisbie Senior Center from 11:30 to 2 pm as we serve lunch to area seniors and their families. We will serve a full turkey and stuffing meal and then join the tables for our own lunch. It's lots of fun and always makes for interesting conversation. There is no meeting the following week, as we celebrate Thanksgiving with family and friends. See you in December! John Alan Boryk is a quiet but compelling soul who has experienced profound personal change in his life. His upbringing in the segregated South in no way prepared him for an integrated college in Aurora in 1965, nor the nearly overpowering experience of hearing Dr. Martin Luther King preach at a modest worship service in the same community. As John puts it, "I couldn't NOT go to Selma." In 2015, John returned to Selma for the fiftieth anniversary of the heroic marches. You can read about his experience more fully in the Des Plaines Journal. He shared his thoughts and feelings about the history of racism in our country and its present state today. His advice to us was to "Learn all you can. Ask an African-American about their experiences. Think about what you might be missing out on." 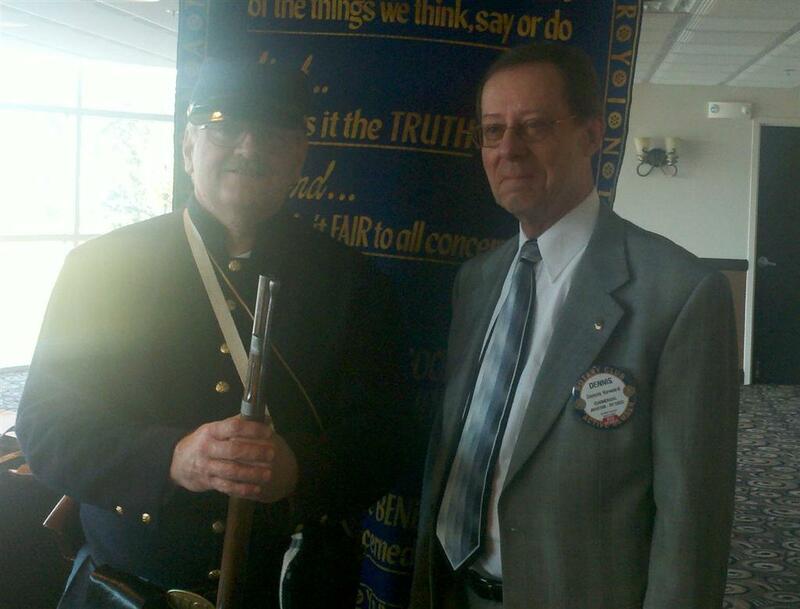 That has been his mission since 1965, as a Pastor, as a Rotarian, as a human being. What Do We Know about Micronesia? The answer is, not much! Our speaker, Melissa May, posed a few basic questions, and we all looked at our feet. 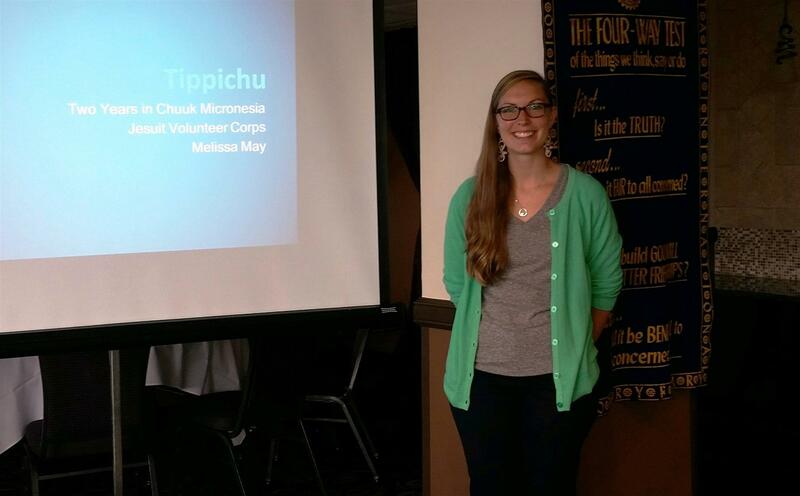 Luckily, Melissa spent two years as a teacher in Micronesia as part of the Jesuit Volunteer Corps program, and came to talk about her experience. Melissa was no stranger to volunteer work, having visited Mexico regularly since she was in fourth grade, but Micronesia was eye-opening. Micronesia is a small group of islands East of the Phillippines. They have been inhabited for thousands of years, and the people were prodigious sailors and navigators, covering hundreds of miles of open water in outrigger craft. This is still a great source of cultural pride. The islands were occupied or settled by various European nations for the last 500 years, some quite brutally. After World War Two, these small states came under the control of the United States, and all Micronesians can travel to and from the U. S. without a passport. The economy is almost completely dependent on American financial support. Melissa spoke movingly about their loss of identity and culture during these various occupations, and the conflict between wanting to retain traditional values and also embrace educational and modernization opportunities that would give them more options in life. As a teacher, Melissa walked this line carefully, getting to know the families as well as encouraging her students in a wide range of activities. It sounds like it was a wonderful experience for her - and certainly wonderful for us to hear about! 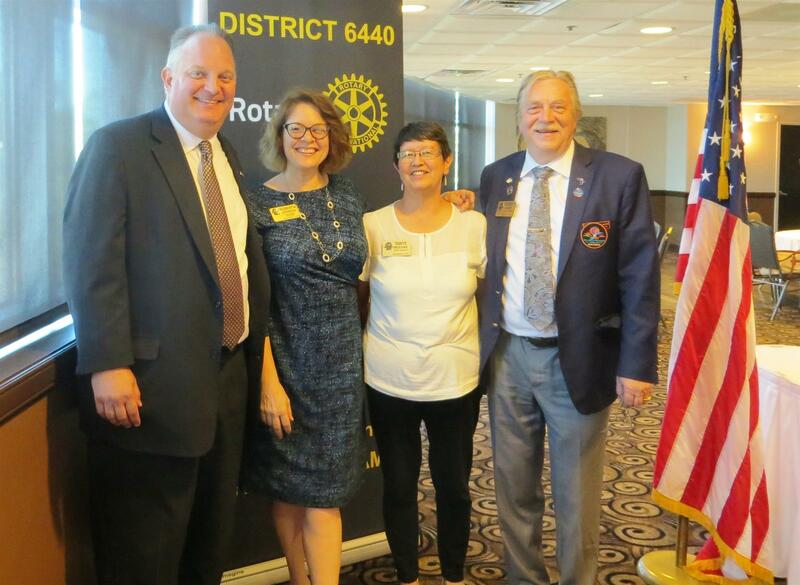 Daniela and I were honored to attend the installation of District 6440's new Governor, Rodney Adams of the Mount Prospect/Prospect Heights Club on June 27th. It is also the one hundredth anniversary of our district, the Home District, so it was quite the party! Wendy Morgan, Rodney Adams' wife, also sang to honor the occasion, and we enjoyed lively remarks from past district governors Bruce Baumberger, Jack Blane and RI Director Mary Beth Growney Selene. First Friday at Katie's Kitchen - be there! We're sponsoring breakfast at Katie's Kitchen on Friday, August 7, from 8 to 9 a.m. Join us to help promote our upcoming Tomatina event, and meet fellow Chamber members. Donn Ziebell wants Americans to think, "Now that I can, should I?" His new book, Conceal Carry - Pause, is all about making a thoughtful decision about carrying a gun, and what that decision may mean down the road. Are you prepared for a three second gunfight? Are you prepared for the legal troubles that immediately follow? Donn reminded us that both armed and unarmed people should follow the same procedures in a dangerous situation, because having a gun does not necessarily make you safer, especially if you take risks that you shouldn't. Be aware of your surroundings, retreat whenever possible, don't get in the way of first responders, and be well-trained in the use of your weapon. He believes that educated persons with a concealed weapon can be significant deterrent, but only if they protect themselves and others before reaching for their gun. Donn's book is available in paperback on Amazon. Mike Munro, Associate Publisher of Chicagoland Golf, told the eye-widening story of how he built one of the state's first domed driving range, White Pines Golf Dome in Bensenville. Rain, snow, vandalism and consultant crises couldn't stop him from raising a 100 yard long fabric dome to accommodate winter enthusiasts. Mike's stories of grass on the ceiling and repairing 39 foot rents in the dome made us admire his sheer grit on the project. From the beginning, Mike said, he wanted it to be accessible to the entire community, so he organized youth tournaments, fundraisers and parties. 24 years later, he has recently sold the dome, but his community committment is still strong. Mike has been on the board at Maryville for years, and we discussed the dire state of social services in Illinois - 50th in the country. Forgive the pun, but Mike is still out there swinging, and we will try to follow his example. 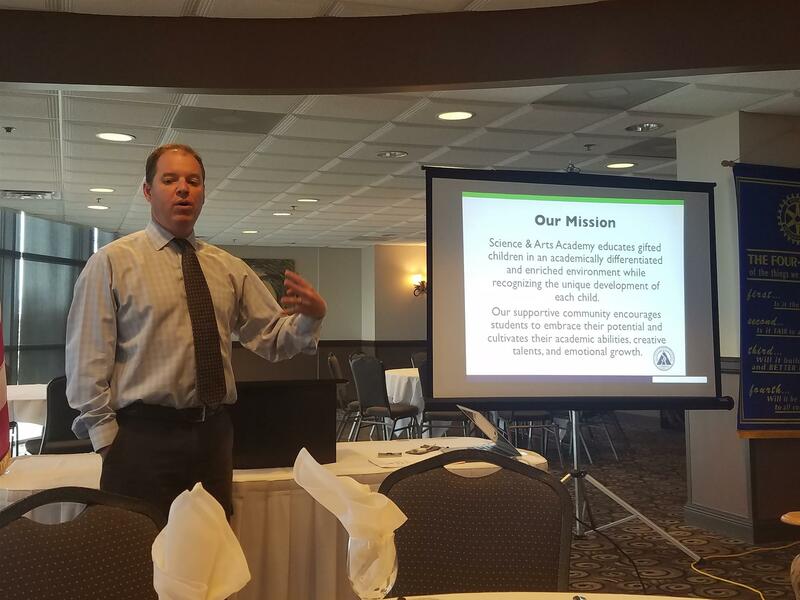 Superintendent of District 207 Ken Wallace shared the stellar history of the district's three high schools, from diversity to innovation. they were the first district to offer an auto shop class for example. For students that aren't succeeding, "They don't remediate - they accelerate," Ken told us, as he described a system that has made the Washington Post "Most Challenging High Schools" list again this year. A new computer service program, Chrome Depot, in each high school, allows students to get tech help when they need it year round. He reminded us that most of The Breakfast Club was filmed in the closed Maine North High School in 1984, and they have a copy of the script to prove it! We were delighted to host Lauren Munson of Two Men and a Truck, who told us about the company's community engagement program. They are active on the board of the Self-Help Pantry, the Des Plaines Chamber of Commerce, and coordinate several clothing and toiletries drives during the year. You may have seen Truckee out and about when collecting boxes of coats and gloves in the winter, and toiletries for needy Moms in May. From the very beginning, Two Men and A Truck have pledged money and practical support to every community in which they have a franchise - and Lauren is such a great partner to work with! Maine West 5K now on May 30! The Maine West 5K Walk/Run has a new date - Saturday, May 30! Registration starts at 8 a.m. and the walk begins at 9 a.m. See you there! 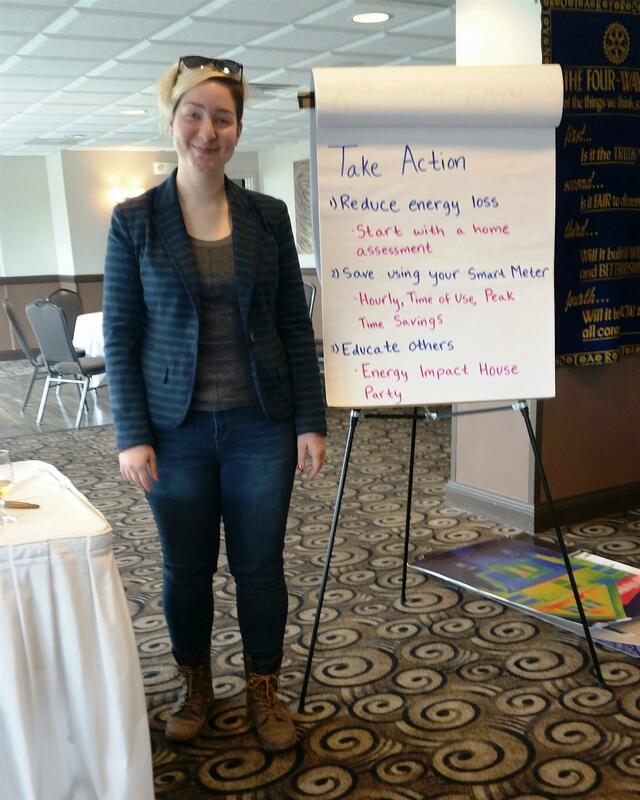 Liz Corrado works with the Citizens Utility Board (CUB) and Elevate Energy to help residents, at low or no cost, to reduce energy loss and waste in their home. She visited us with a double handful of helpful knowledge. Where does your home lose energy? 68% is lost from the attic and the basement! What are the two top things you can do to reverse this loss? What else can you do? Get an energy audit for your home! If you host an energy "party" with your friends and neighbors, the audit will be free, and Elevate Energy (a non-profit) will give you multiple ideas to make improvements quickly. If you invest up to $2,000 in these improvements, the average savings is $400 per year. The energy companies are working toward this goal too. The nearly completed Smart Grid will allow utilities to re-route power in emergencies, to know about failures BEFORE customers call them, and prevent energy waste. ComEd will send you text alerts in the summer during peak usage times, and if you turn up your thermostat or postpone those loads of laundry, they will credit a few bucks to your account. Or you can try out different methods of energy pricing to save you money. Check out the websites above to find out what you can do to trim your energy bill and fatten your wallet! Rick Kaempfer can tell a great story - and he's got a lot of great stories to tell! After more than a decade as a radio producer and host, working with the likes of Steve Dahl and Garry Meier, and dozens of music and film stars, Rick decided he'd had enough of 18 hour days and became a stay-at-home Dad to his three little boys. His wife went back to work in the financial world, and Rick, used to writing four hours of comedy a day, began to record his favorite family stories as a comedy outlet, ultimately creating a popular blog that has been running for ten years. The comedy usually comes at his own expense, as the title of his latest book, Father Knows Nothing, cheerfully makes clear. Rick has also written an Indiana newspaper column, and novels and biographies too. His oldest son is in his twenties now, and Rick hopes that these recorded memories will someday be as satisfying to his sons as they are to him. And if you're a Cubs fan, you'll definitely enjoy One Bad Century, Rick's Cubs Nation blog. As Rick said, "When you spend every day looking for humor, you'll find you're a pretty happy person." 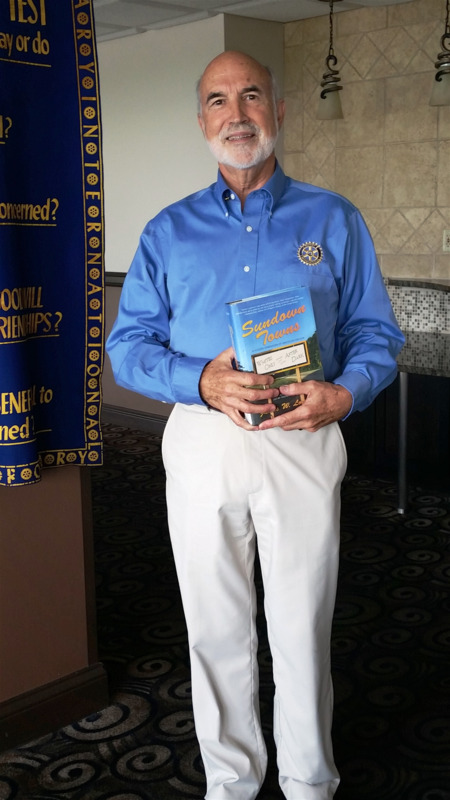 Thanks for sharing a bit of your life with the Des Plaines Rotary Club! Father Knows Nothing, available from Eckhartz Press or as an Amazon Kindle e-book. Run out of diapers? Need a phone charger right NOW? Can't find your grandmother - who speaks Farsi? Have a 2 hour layover with a newly adopted infant? John Ishu and Travelers Aid can help. Founded in 1851,and originally based in Union Station, this organization has been helping travelers in crisis find their travel in and out of Chicago a little easier. They feed hungry pets, guide special needs travelers, smooth the way for injured military personnel, and help returning Americans and immigrants of every age. Travelers Aid is primarily run by specially trained volunteers, who speak dozens of languages, and whose "job description" is part librarian, part social worker, and part travel guide. They know that travel, especially through such a large and busy airport as O'Hare, can be stressful even when you're not in any of the situations described above. Every year, they help over 600,000 travelers. Look for the volunteers in the blue vests the next time you are at O'Hare. Or maybe consider volunteering yourself - like Des Plaines Rotarian Werner Juretzko, who speaks several languages and spends several hours a week with Travelers Aid. Jerry Swerski and Sally Thompsen visited our club on February 12th to tell us the story of Pillars of Honor, Inc. and let us know about an upcoming program at the Frisbie Senior Center in July. Pillars of Honor, Inc. was founded right here in Des Plaines as a way to share the breathtaking World War Two memorial in Washington DC with veterans and their families that cannot make the long trip to the capital. Pillars of Honor arranges to transport the beautiful and unique scale model of the WWII Memorial in Washington D.C., designed by world renowned architect Friedrich St. Florian, to our WWII Veterans at local events across the country. 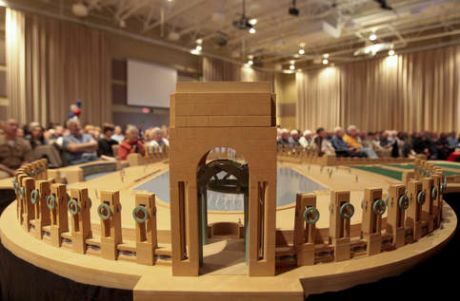 Thanks to local volunteers and organizers like Jerry and Sally, you will have a chance to see the model up close at The Frisbie Senior Center on July 11. There will also be talks and tales of the Honor Flights and other moving encounters of veterans with their memorial. the Rotary Club of Des Plaines is proud to be a supporter of this wonderful event. Hearing Mike talk about Catholic Charities was certainly an eye opener. This organization serves the geographic area of the Chicago Archdiocese, and has over 150 programs for the public, from food and clothing pantries to counseling, senior apartments and early child development centers. 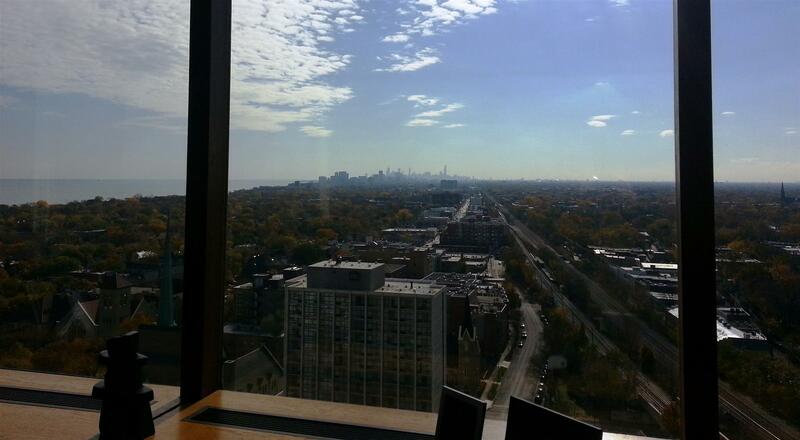 And all this is headquartered right here in Des Plaines! The Church with a capital C does not financially support the organization, though of course many parishes volunteer time or raise money for them. 92 cents of every dollar they raise goes directly to their programs. That's an organization we can feel good about supporting. 2014 was a wonderful year for our club, full of great speakers, friendly gatherings, new officers and a host of service activities. We closed out the year with a beautiful performance by the Maine West Warrior Strings. We are so fortunate to live in a community that really values the arts for its children! Check out those red shoes! 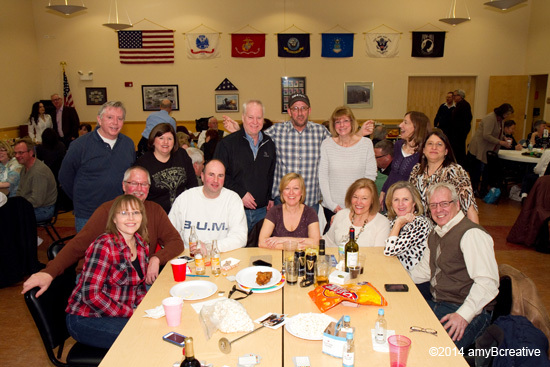 In the new year we will bring on our annual Trivia Night Fundraiser in March, stay active with Harbour House, Maine West High School, Bessie's Table, the Frisbie Senior Center, Maryville Academy, the Des Plaines Self-Help Pantry and even more! Won't you join us? Ms. Azin Djalali is the new Physician Liaison to the established chain of Podiatric care centers, Weil Foot and Ankle Institute. She visited us to tell us a little more about the Des Plaines office located right across the street from Holy Family Medical Center. Their podiatrists treat everything below the knee, from diabetic nerve care to sports injuries. Have a hockey player or point guard in your life? Weil might be the perfect solution for them. Weil also treats common ailments such as Plantar Fasciitis, neuropathy, and ankle sprains at 21 locations in Illinois and Indiana. Don't put up with foot pain if you don't have too: there are many new treatments you might not know about! 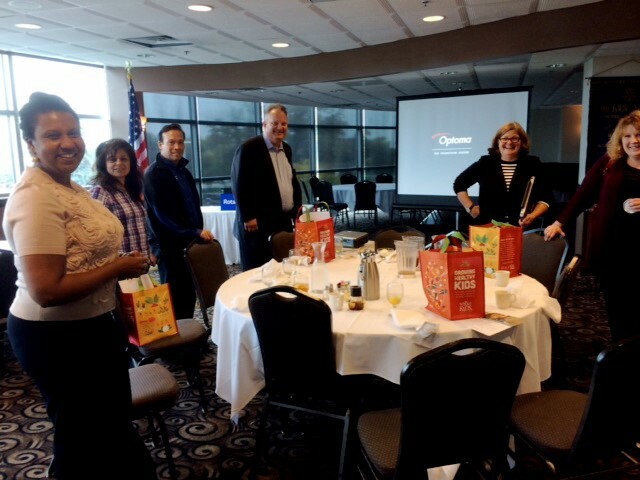 Nancy LaBreacht from Whole Foods Market in nearby Park Ridge, recently gave our club an interesting and impressive lecture and demonstration on one of America's most innovative grocery chains. From a single natural foods store start in 1980 with a grocery store employing 19 people to an organization of 2000 employees to-day with locations from coast to coast. Architectural remodeling is presently ongoing on five former Dominick stores nearby, to be open coming January 2015. "America's call for a balanced, gluten-free healthy diet, with the most nutritious food, without artificial flavorings, sweeteners, colorings and preservatives, is the path our organization follows. Being totally switched to organic foods by 2015, is Whole Foods Markets goal." said Nancy LaBreacht. And we all got goody bags! Another Boy for David and Shannon! Zion David Martinez was born last weekend to the proud parents below, last seen eating red velvet cake in the Club Casa banquet room. We look forward to meeting Zion as soon as Shannon and David catch their breath. Sandy Sullivan is a genuine character, the kind of person you always hope will be seated next to you on your flight. A small town girl who ended up married to a power player in Washington D.C., and then returned to Wisconsin to raise her daughter and eventually run for Secretary of State, she is one of the most engaging and lively speakers we've ever had at our club. Pictured here with Ella Bramwell, Sandy told us stories of working with Vince Lombardi, dating Paul Hornung, and the inside scoop on Wisconsin politics. You can find her book, Green Bay Love Stories, on Amazon. 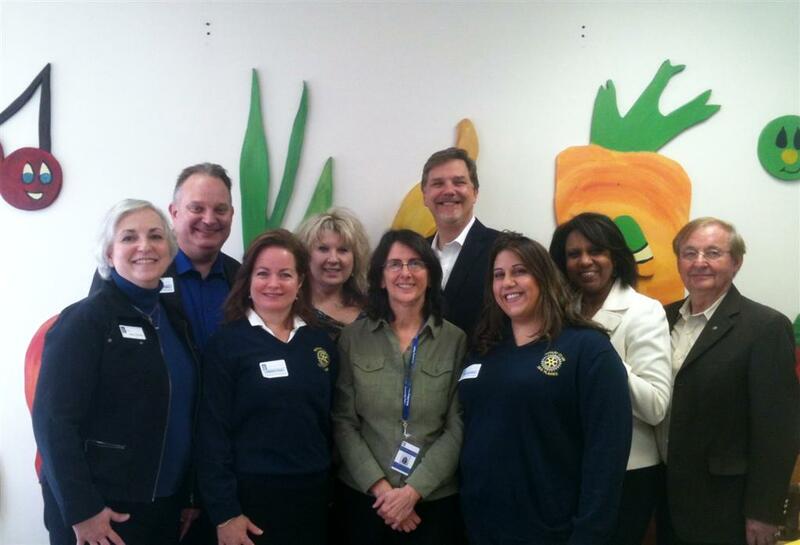 Our members represent the businesses and organizations of Des Plaines, Illinois. If you want to know the people that guide the schools, the library, the Y, local government, as well as those people that support the city as individuals, please join us at our regular Thursday lunch at Club Casa, 353 N. River Road, at 12:15. And the Winner Is ?!? Lucky #7! Table 7, that is, with Rotarian Daniela Krivak and her guests from Maryville Academy and Harbour House. They won the day after regular play ended in a three way tie. March Madness indeed! Trivia Night was a Great Success! 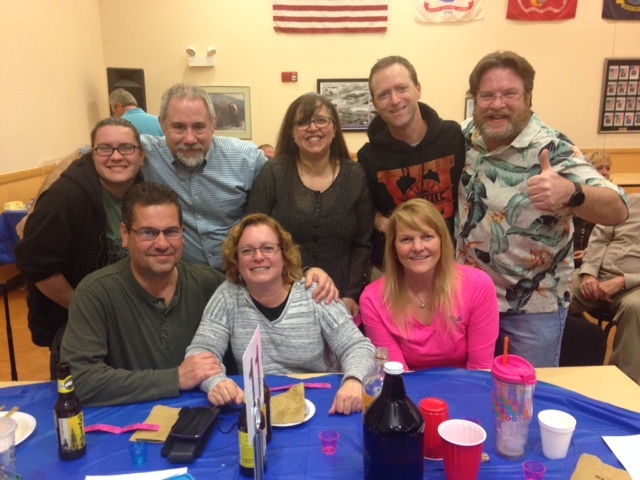 We gathered for the third time at the Frisbie Senior Center to play trivia, eat, drink, and raise money for our Dave Webster Vocational Scholarship fund. This year we had over 120 people attend, thanks to the efforts of Rotarians and their friends - including many people who have joined us since the beginning. The Park District gang celebrates! We were thrilled to have a professional photographer taking candids and table shots at the event. Please visit Amy B. Creative for a look at all of Amy Byer's lively shots of the event. Thanks to Sharon Lynch for arranging for Amy to volunteer her time and talent! And of course, the fabulous event committee: Daniela Krivak, Steve Pokrak, Tina Garrett, Mary Kieger and Dennis Oster. Who won, you ask? The main event ended as a three way tie, and the final winners were . 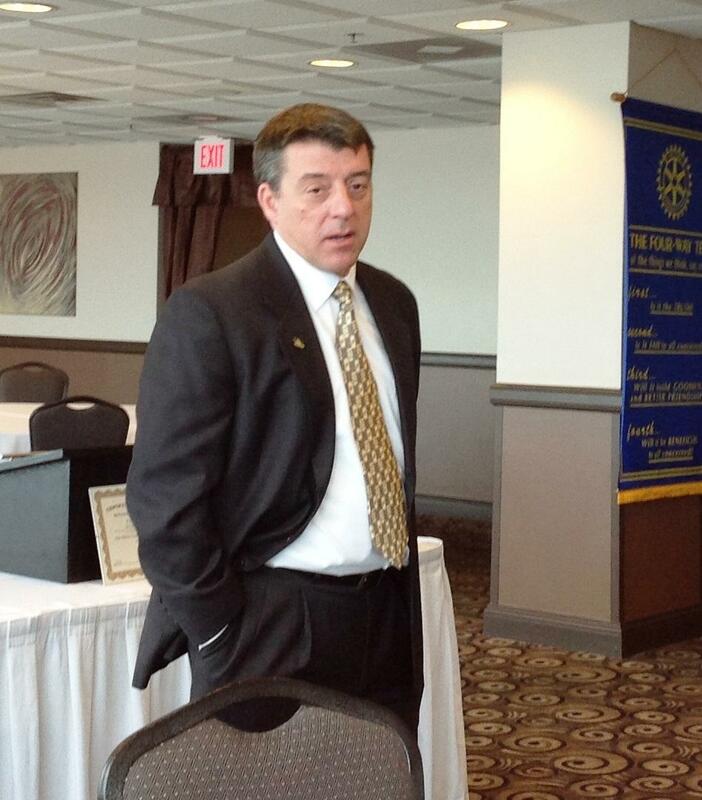 . .
Today we got to meet George Sakas, the new Director of Economic Development in the City of Des Plaines. George's position covers everything from streamlining the process by which new businesses start up in the city, to evaluating different corridors and neighborhoods for targeted development. George has been doing this for more than twenty years, most recently in Schiller Park, so he's familiar with Cook County processes, the northern suburbs, IDOT, and all the other pieces that are involved in addressing these community improvements. Des Plaines has a strong business environment, as our very successful Chamber of Commerce indicates, and we are also a transportation hub, being near the airport, two Metra lines and several major highways. Our club members had lots of questions for George, his talk was interesting and informative, and we hope to see him back at lunch with us soon! What are you doing on February 27th & 28th? Don’t forget to sign up to HELP! Our club has donated $500 to Maine West Young Hearts for Life program. They are also looking for volunteers for Thursday, February 27, and Friday, February 28, 2014. What's new in our club? Trivia Night is fast approaching and we are getting the word out to family, friends and coworkers. 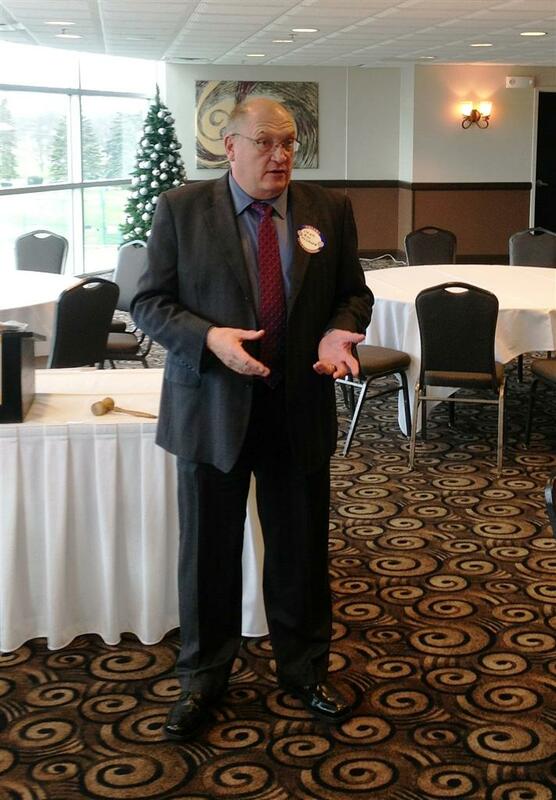 In the meantime, we've also been learning more about the mission of Rotary International from Michael Ericksen, as well as thinking about the role of our former officers, who continue to guide the club with their experience. We've also been out in the community, serving dinner on a bitter POLAR VORTEX evening to folks who really need that hot meal at Bessie's Table. Less than zero outside, and 50 people, including families with small children came out to enjoy a little fellowship and a lot of Greek Chicken and Rice. We Rotarians also got to meet some lovely volunteers from a church in Niles and talked with them about their mission and volunteer service. Look for more information about our upcoming Trivia Night very soon! The date is March 8th, and tickets are still just $25 for dinner and entertainment and some fierce competition among friends. This year's theme is THE EIGHTIES, so dust off your DeLorean and join us at the Frisbie Senior Center. A Grand Celebration at the Black Ram! We spent a lovely, snowy, December evening celebrating the memory and impact of Rotarian David Webster on December 13th, 2013. Joining us were his wife Beth, and two of his three daughters and their families. Tina put together a a wonderful slideshow of Dave throughout the years and always with a smile on his face. We miss Dave every Thursday, but we are so lucky to have been a part of his life. We had dinner and cocktails at the newly re-opened Black Ram Restaurant at 1414 East Oakton. The new owners are Bulgarian, and the menu feels part Mediterranean, part Baltic, and part Middle Eastern. Charcuterie and cheese appetizers, fresh crisp salads, grilled chicken and marinated pork, flourless chocolate cake - we'll be back there soon! The club formally inducted three new members (Daniela, Andy and Rose), welcomed new officers for 2014, and gave a special award to our 2013 Rotarian of the Year to Ella Bramwell. Ella serves as speaker coordinator as well as contributing to the website and every community activity in which we are involved. She has organized an excursion to see the Cubs play, a tour of Rotary iInternational, an afternoon at Holy Family Medical Center, and many other special events. 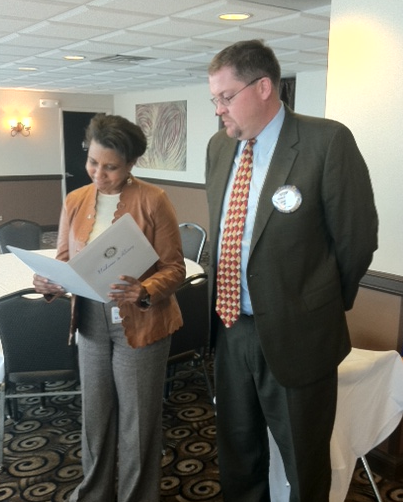 We are thrilled to have Ella as a member of our Rotary family. The President was not in his office, of course, as it is his duty and privilege to spend his one year term visiting as many clubs as possible around the world, as well as meeting regularly with the Board of Trustees. Their conference room was also impressive, with technology for the trustees and their interpreters, as they are from many different nations. This building has many wonderful stories to tell, and I encourage every Rotarian to visit one day. We were accompanied on our tour by a visiting Rotarian, Bala from Chennai, India. He graciously invited to host us in his home if we ever made it to India, "But not all at once, please." 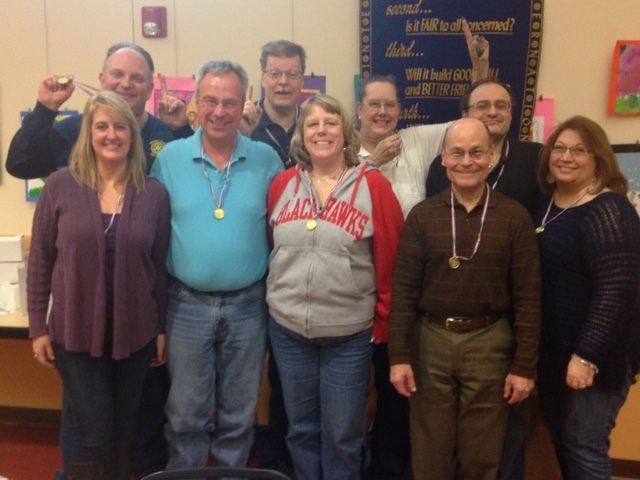 From left to right: Werner, Sharon, Steve, Denny, Mr. Paul Harris (in bronze), Steve, Tina, Ella, George, Roberta and Bala. Maine West Choraliers Are Bringing Some Holiday Cheer! 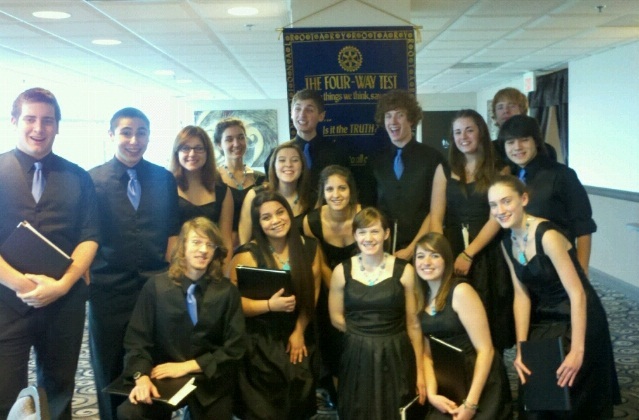 We are looking forward to another visit from the wonderfully talented students of Maine West. What a great way to ring in the Holiday Season, last year we were entertained by The Maine West Warrior Strings, and this year we will be enjoying the musical talents of the Maine West Choraliers. We had such a wonderful time last year serving lunch and socializing at the Thanksgiving lunch that we are thankful to do it again. 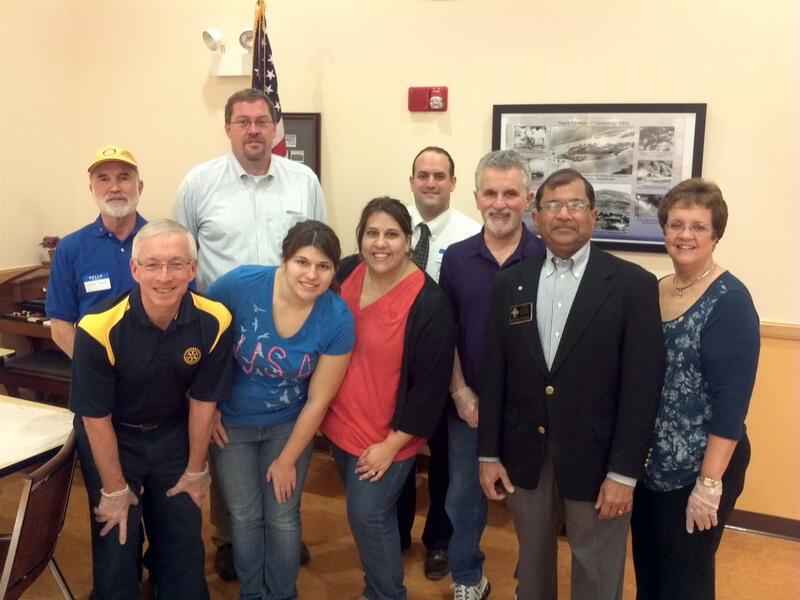 All Rotarians and community members are welcome to join us as the Rotary Club of Des Plaines serves Thanksgiving Dinner Wednesday November 21st, 2013 at Frisbie Senior Center, 52 E. Northwest Hwy, Des Plaines, IL. Please arrive by 11:15 am. Call Sharon Lynch with questions - 847/471-1984. 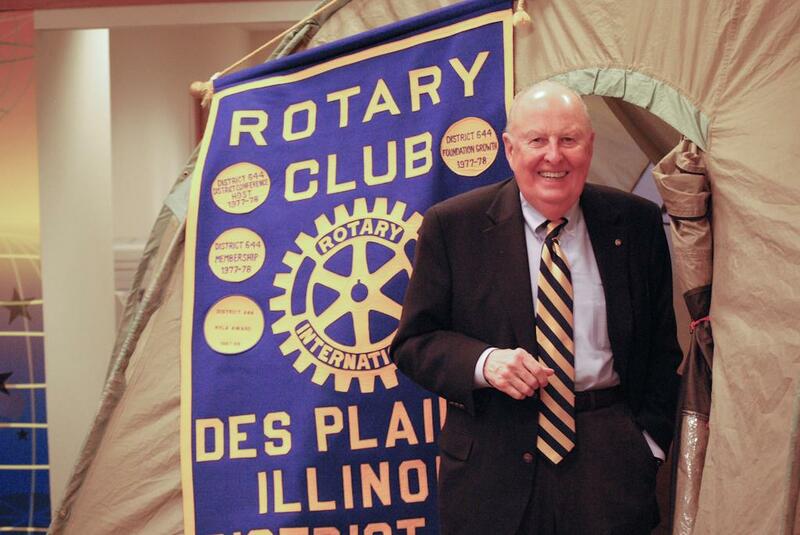 This week the Des Plaines Rotary Club suffered a great loss. Dave Webster, past president, secretary, and probably every other office as well, passed away on Wednesday, September 18, 2013. He was a member for 33 years. Can you tell from this picture how delightful Dave was? Dave represented the best of humanity and Rotary: hard-working, generous, welcoming, and as he described our group with a wink, "a do-gooder". He was also a devoted husband, father and grandfather, a proud Scot who rarely missed the Highland Games and a former Navy man. We are all lucky to have known Dave, whether for decades or days, and we will miss him very much. 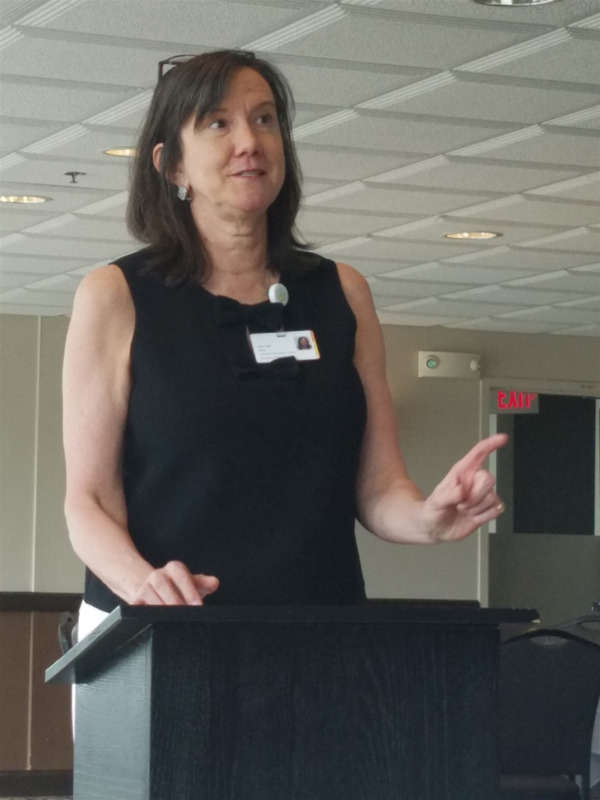 We were pleased to host Teri Collins, Ph.D., the director of the Maine Community Youth Assistance foundation as our speaker last week. MCYAF has focused for years on teen health and welfare in our communities, serving the local high schools and campaigning in the area to raise awareness on substance abuse. Teri is a scientist and an educator, and she knows all too well the effects of alcohol, prescription meds and other drugs on the still developing brain. The greatest concern right now is the availability and wide mis-use of prescription drugs. In the U.S. there are more fatalities from drug overdoses than from traffic accidents! We've all heard of oxycodone, but medicine cabinets are full of other painkillers and muscle relaxants, and kids have easy access to them at your house or Grandpa's house. MCYAF has funded a drop box at the Des Plaines Police Station for unneeded medicines - just drop in the pill bottle. Dr. Collins also made us aware of coming legislation called the Prescription Drug Monitoring Act, which will allow pharmacists and doctors to see whether a patient has filled multiple prescriptions in different communities and even across state lines. State lawmakers are also looking closely at prescription sales. The more awareness, the better, and we thank Dr. Collins for giving us such an interesting and timely talk. We Meet our 2013 Scholarship Winners! Max Jacobs and Sandra Reyes came to lunch on June 20, to accept their $1,000 scholarship checks and tell us about themselves and their future plans. Max will be attending the prestigious Kendall College culinary program this fall, and Sandra will be attending Oakton Community college and then Harper College to complete a Dental Hygienist program. Our third winner, George Hozan, who is enrolled in an automotive program at the Universal Technical Institute this fall, could not attend, but we look forward to meeting him and his family later this summer. All of our applicants received glowing letters of recommendation from teachers, counselors and city officials. It was a challenge and a pleasure to choose three winners! 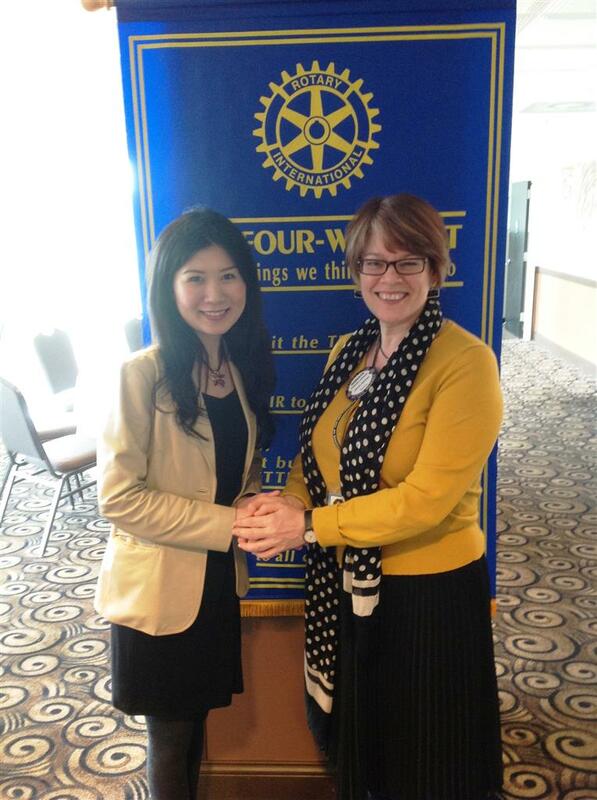 What Does a Rotary Ambassadorial Scholar Do? If you're Emi Yokoshima, you travel the world visiting Rotary clubs, you organize student multi-cultural events all over Japan, you work for Tokyo Disney, and you pursue a Master of Business Administration at the Kellogg School of Management. For starters. Emi visited our club in June to tell us about her travels and impress us with her energy and charm. Alex Dambach wants to make it easier to get things done in Des Plaines. Particularly, he wants your business to thrive, and new businesses to move in. As the Director of Community and Economic Development, Alex and his staff plan to update the City's zoning and building code, expedite their zoning review process, and of course, increase economic growth in the community. He also wants to highlight Des Plaines' local, unique identity. Who else has the Choo-Choo, the first McDonald's, the glowing Sugar Bowl sign, the largest YMCA in the world, and a dozen other landmarks? We also have a great Park District, Library and school system, and Alex is getting the word out to potential investors and franchisers. Alex spent half an hour getting us fired up about the opportunities from growth and progress in our community, and illuminating some of the practices involved in urban planning. We feel lucky he's joined our city staff! Who DOESN'T Like a Birthday Present! Tina Garrett has worked hard to help the young women of Harbour House find a little something extra to celebrate. 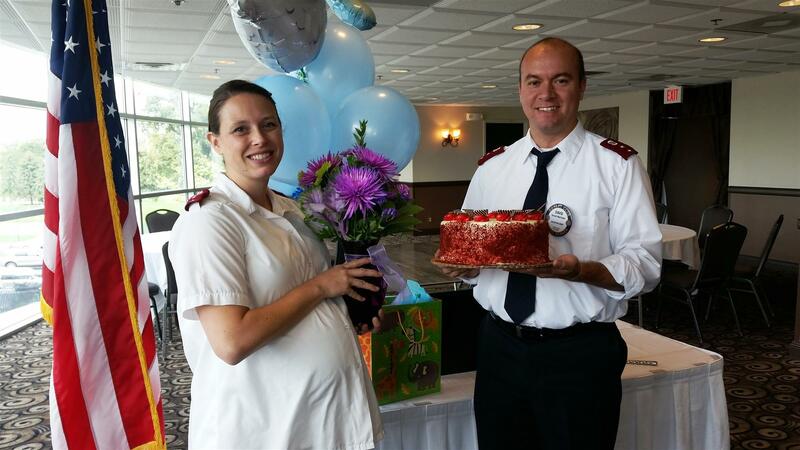 Her initiative with Rotary of Des Plaines allows each girl to celebrate her birthday with cake and presents. Tina laughs when she explaines her shopping method, "It's either totally girly, with nail polish and ribbons, or not-so-girly - with black nail polish!" Since most girls enjoy making a little something crafty for themselves, whether a bracelet or a decorated picture frame, Tina usually includes a gift card to Hobby Lobby. Mary Krieger from Maryville helps sort, pack and delivery the birthday boxes, which include everything needed to bake a cake and an assortment of little gifts. It even comes with a cute basket! 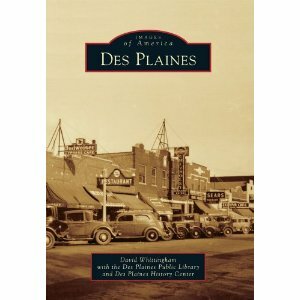 The Des Plaines History Center and the Des Plaines Public Library have collaborated on a marvelous new book of Des Plaines history, published by Arcadia Press. Written by librarian David Whittingham, the book collects remarkable photographs from our history, primarily from the History Center's vast collection, but also contributed (or authenticated) by local residents. Mr. Whittingham visited our club on January 10 to talk about the book's creation and show us some wonderful images. The process of identifying, verifying and organizing the book's images was really fascinating. We purchased multiple copies and will use them as thank-you gifts to our future speakers. If you're interested in your very own copy, you can purchase the book at the History Center store and at local Walgreen's stores. The library also has multiple copies if you'd like to check one out. Summing Up the Old Year, Welcoming the New Year! At the close of 2012, we said thank you in the most tangible way to two of our long-running Rotary partners. The first is the Salvation Army of Des Plaines, who we recognize as a powerful force for good in our community and around the world (like Rotary, we hope!). In December we donated $500 to the Salvation Army. We also staffed the kettle and rang the bell on Saturday December 15th, which is always both fun and a powerful reminder of the folks they serve. This year two people came up to me in my brief hour and thanked the SA for "helping to feed their family this year." 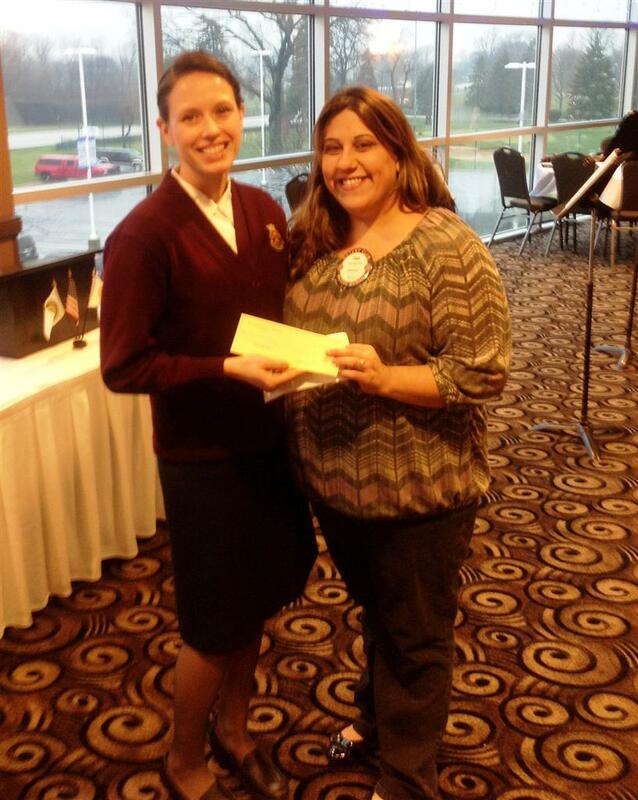 Here is President Tina Garrett presenting the check to Lt. Shanon Martinez. We also thanked someone who has done great service for our club week after week, by serving our delicious lunches. Brittney is now a college student, and we're glad to support her and lucky to have such a cheerful presence every Thursday at Club Casa! We're celebrating the New Year with our first meeting of 2013 on Thursday, January 3rd - we hope to see YOU there! Last week we had a tour of Holy Family Medical Center, which has been redefining itself as a cornerstone of Des Plaines health and wellness. In the community for decades, Holy Family is now part of Resurrection Health Care, and is offering multiple new services and specialized care centers. Among them are a cozy (and comforting!) Mammography Center, a Vein Center that can alleviate visible and invisible vein conditions with minimal discomfort. Holy Family also offers substance abuse treatment and rehabilitation, specialized pain therapy and a variety of other medical services. This August Holy Family held its fourth annual Fun Fest, inviting families to a day of storytelling, face-painting, health-related activities and free medical screenings, to which over 300 people came. Rotary donated bottled water to all of the hardworking volunteers and also supported Holy Family's efforts to give the first 100 kids a backpack filled with essential school supplies. It was a great event and we look forward to participating next summer! On December 6, 2012, we greeted Chief William Kushner, who joined the force in September. Chief Kushner is a 29 year veteran of the Chicago Police, as well as heading up two suburban departments in Berwyn and Lakemoor. Des Plaines is not the only suburb facing turmoil in its police force, the Chief made clear, as he talked about his previous experiences and his optimism that this department will come out even stronger and more focused in the coming months. The Chief emphasized the experience and skills of his officers and patrolmen, citing their excellent training and cohesiveness as a group. Our Rotary members echoed that opinion - many of us have had excellent support from the police in our various businesses and organizations. The Des Plaines crime rate is one quarter of the state-wide crime rate, according to the Chicago Tribune (2010 statistic, reported on 9/12/2012). 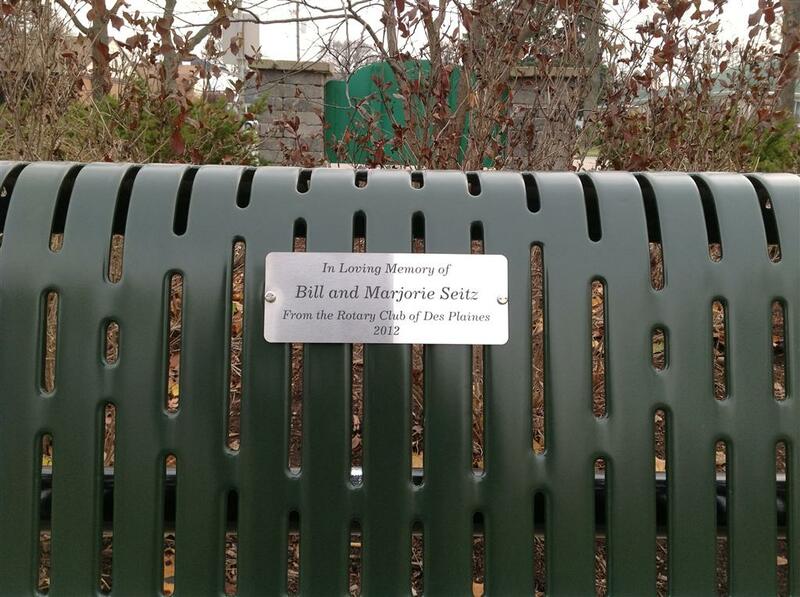 Bill Seitz was a decades-long member of the Des Plaines Rotary club, and when he and his wife Marjorie passed within a few weeks of each other, we wanted to remember them in an equally lasting way. There is a lovely little park a few blocks from their home, and they and their children and grandchildren spent many hours here. 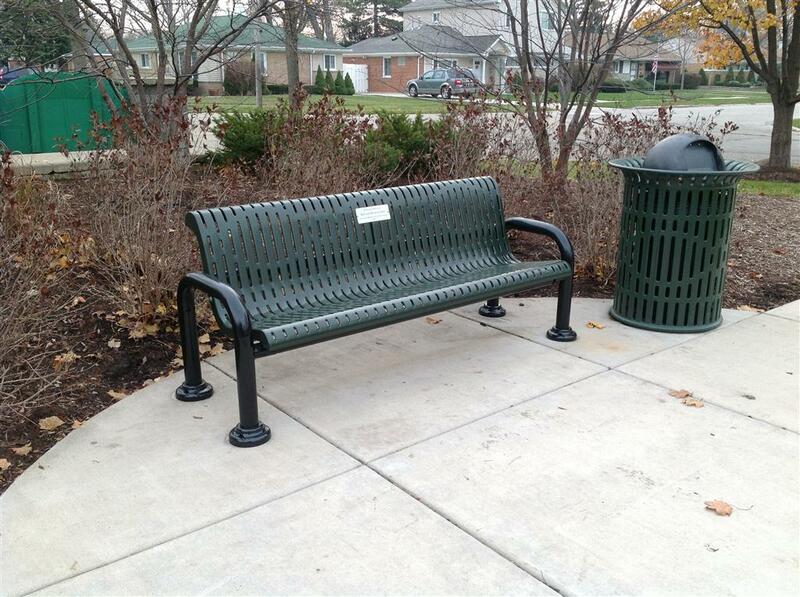 With the help of John Hecker, Rotary member and Administrator of the Des Plaines Park District, we installed this lovely bench for other parents and grandparents to take a break and watch their kids at play. Join us at a wildly fun movie evening on November 2nd! Don't dream it, be it! If you recognize that tagline, then we invite you to a showing of The Rocky Horror Picture Show at the Des Plaines Theater at 8 p.m. on Friday November 2nd. This newly renovated theater has gorgeous Egyptian-style details throughout the auditorium, and a guest "cast" will be selling souvenirs and snacks at the concession stand. It's a fund-raiser for the Des Plaines Optimist Club, and tickets are only $10. The Rocky Horror Picture Show has a 37-year-long history of audience participation, from people talking back to the screen, dressing up as the characters, and throwing confetti in the air. It's a musical AND a live stage show! If you've never seen the movie, then you've gotta come! That's a young Susan Sarandon, Barry Bostwick, Tim Curry, and yes, that IS Meatloaf on that motorcycle. Click here to purchase tickets, and join us for a fabulous Friday night. There will also be a midnight showing (the traditional show time) where the visiting cast will act out the movie simultaneously - if you're young enough to stay up that late. 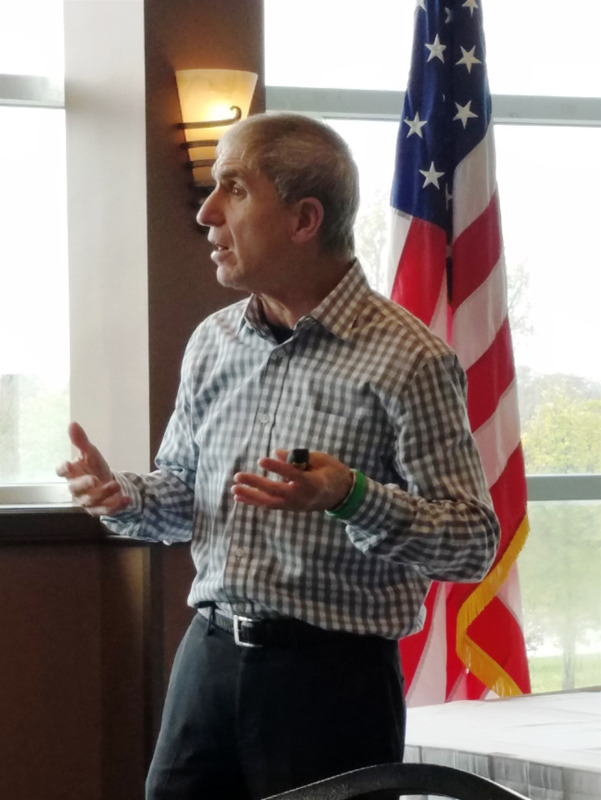 In the last few weeks, Rotary of Des Plaines has hosted a candidate for State Representative, decorated a room for Harbor House, given presentations at the world's largest air show, planned a joint meeting with Rotary of Arlington Heights, and learned the inside scoop of the (second) Blagojevich trial. Now that sounds like a dynamic organization! I hope you were present at some or all of these events, but let me tell you a little more about those you might have missed. 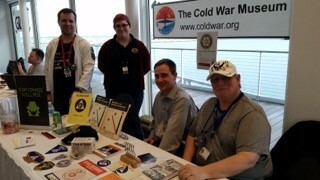 Chris Sturdevant and Werner Juretzko, officers of the national board of the Cold War Museum were speakers at Airventure in Oshkosh, Wisconsin. They also staffed the Cold War Museum display booth at this prestigious show. The Rotary logo was vividly displayed at the center's booth. Two jurors from the Blagojevich trial spoke to us in August, and told a riveting tale of democratic integrity (on the jury's part) and of democratic corruption. They gave us insight into the jury system and reminded us of the power of the individual for good and ill in this country. On other political fronts, we were addressed by Democratic candidate for Illinois State Representative of District 55, Martin J. Moylan, who addressed community and state needs and took questions from his audience. On September 27th, his opponent, Republican Susan Sweeney, will join us to share her thoughts and goals for the position. Check out our photo album for some slightly less than glamorous pictures of us painting, building and eating at the Rotary Aloha Room for Harbour House in Des Plaines! And we also thank EVERY Rotarian who helped pick up food, arrange tables, donate prizes, sold or bought tickets, acted as emcee (you rock, Graham! 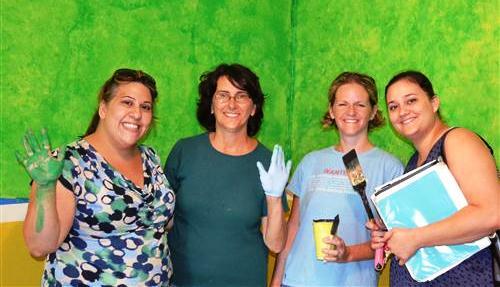 ), sold raffle tickets, helped clean up, got our picture in the paper or otherwise made this event a really fun evening! I know everyone who came is already looking forward to next year. We made $5,000 for our scholarship fund! 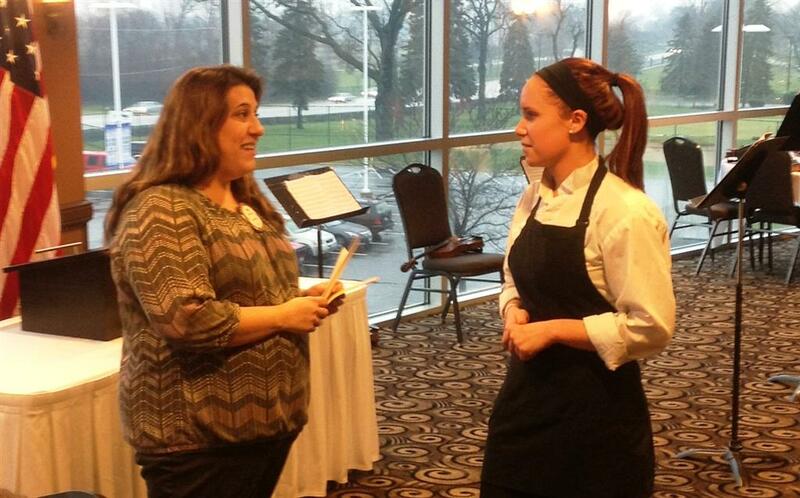 Once again our club is offering scholarships of $1,000 each to support students in vocational or technical careers. The application deadline is May 1, 2012, so please get the word out! Contact Dave Webster for the full application at dwebster@sbcglobal.net. Former Mayor Arredia is always a captivating speaker, but never more so than when he talks protecting the community he loves. "Just because you don't see the gangs in Des Plaines," he warns, "Doesn't mean they aren't here." Tony talked about everything a gang can offer a kid at loose ends: family, respect, a lavish lifestyle. Once they're in, the kids OWE the gang, and it becomes practically impossible to get out. Of course, this life manufactures and feeds off violence, but also disrespect for women, for family. How can we work against the "underground" gangs? Tony reminded us of all the ways to act. "Get to know your neighbors, keep an eye on community spaces like parks, say hello to the kids on your street, get involved in churches, social groups, the library." And most important, speak up when you see something that isn't right. New and returning officers for 2012/2013! Congrats to our new officers for the coming year: President Tina Garrett, Vice President Roberta Johnson, Treasurer Steve Pokrak, and Secretary for Life Dave Webster. 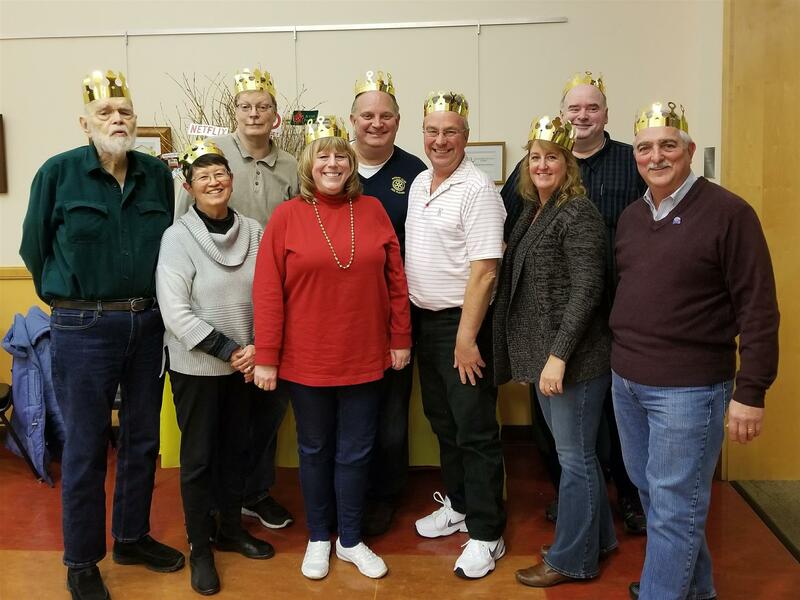 We also say cheers to the following Directors: Sharon Lynch (Community Service), Dave Wiltse (Vocational Service), Jean Lyon (Club Service), and Werner Juretzko (International Service). When was the last time you entered a sporting event and found yourself competing in a world-wide championship? Ummm, for me that would be never. 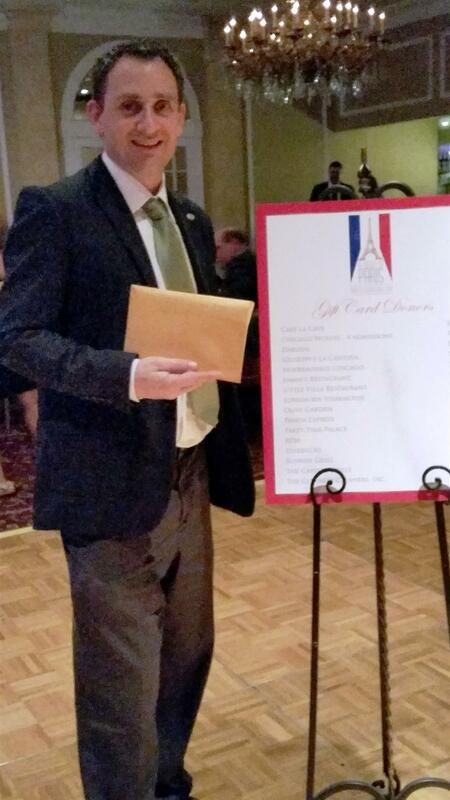 Chris Sturdevant, better known to us as a fellow Rotarian and the curator of the Midwest Chapter of the Cold War Museum, is going to Finland to compete in the World Masters Athletics in the 1500 and 1800 meter indoor races. Chris has been running since high school, but in the last few years he started entering regional and national meets, and winning, and entering at the next level, and winning again. Now he is competing at a world level. While Chris is there, he plans to exchange flags on behalf of his local Rotary . Since he's also a children's librarian, maybe he'll visit a library or too. We're proud to sponsor his trip and be a small part of his exciting journey! Daniel Seddiqui can tell you about both rejection and success. After graduating from college and NOT being hired after 40 different interviews, he decided to explore the working world on his own terms. 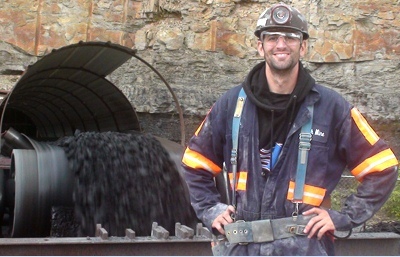 Daniel set out to work one week at 50 different professions, from coal miner to weatherman, in 50 different states. 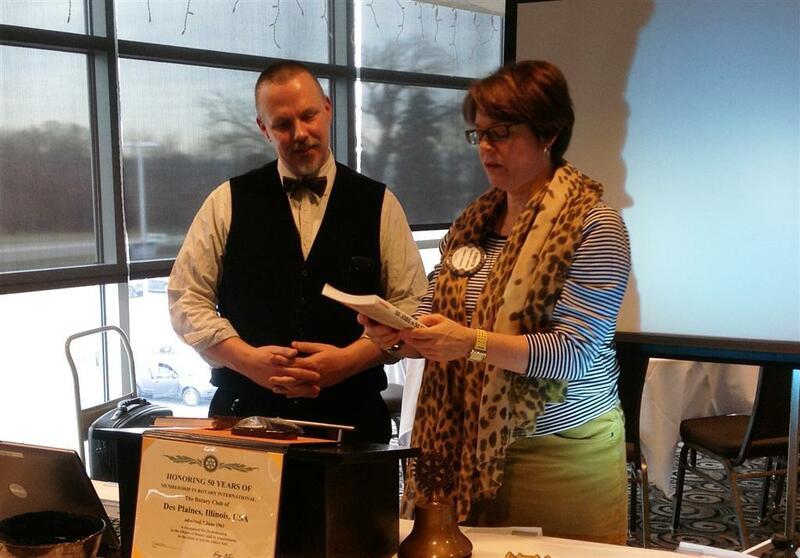 Last week Daniel talked to the Des Plaines Rotary Club about his adventure. And it was in every way an adventure; exhausting, exhilarating, dangerous, and empowering. Library Journal said of his chronicle of this project, 50 Jobs in 50 States, "although not the usual career guide, Seddiqui's look at America through 50 quintessential jobs is both informative and inspiring." We formally welcomed new members Ella Bramwell (Holy Family Hospital) and Steve Samuelson (Frisbie Senior Center) on Thursday, January 19, 2012. We've been enjoying their company for lunch for some time, and it was a pleasure to shake their hands after they receive their packets and pins. 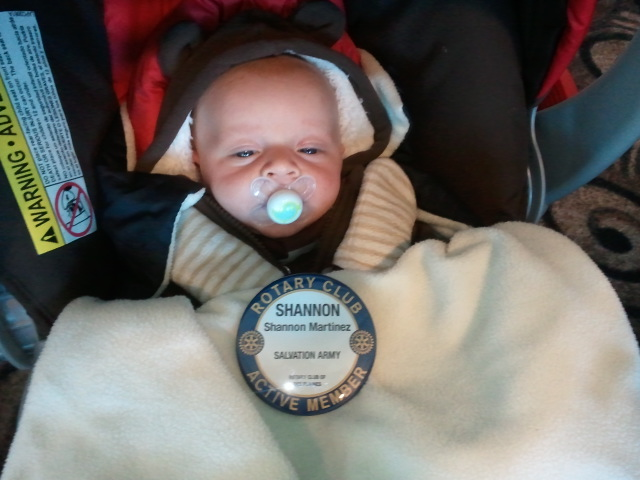 And here is a candid photo of our newest potential Rotarian, Malachi Martinez, proudly wearing his mother Shannon's badge. We were thrilled to welcome him too! Moving Forward, Feeling Behind - But Not For Long! It is a new year, and we're all feeling energized and excited about new Rotary projects (more on those later), but I don't want to forget the beautiful sendoff we had for 2011 by the Maine West Choraliers. You can tell they are a smart, lively and talented group just from this picture! I loved talking to a few of them at lunch about their plans and dreams. Then I closed my eyes and concentrated on their voices. What remarkable gifts they have. He eats cookies and milk in moderation and exercises regularly of course! Exercise is always more fun when it is a family affair, as this father and daughter team can attest to. Nothing makes you feel more in touch with your community than staffing the Savation Army kettle. 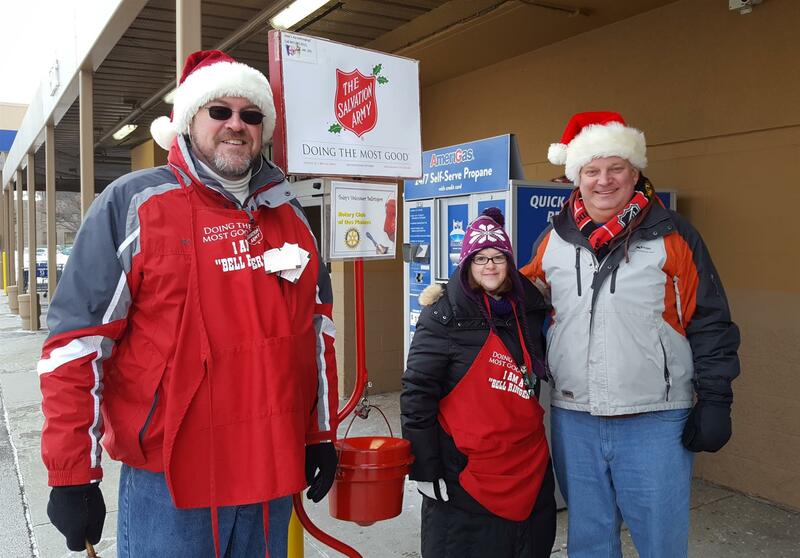 This year we rang the bells at the K-Mart on Oakton Avenue in Des Plaines. It was cold, but not bitter, and everyone greeted us with a smile and usually a donation. One woman cheerfully instructed me on getting more sound out of my bell: "Hold it by the tip of the handle, dear." She was absolutely correct. Mayor Moylan joined Denny and Sharon in the afternoon. His enthusiastic smile and handshake brought in more money than we gathered in any other timeslot! Art Exhibit at Millennium Bank - Join Us! Stricken by polio as a child, Eder Romeus of Jacmel, Haiti, turned to his artistic gifts. Now a performance artist, drummer, and painter, Romeus will show ten new paintings at Millennium Bank, 2077 Miner Street in Des Plaines during the months of November and December. The opening reception is Friday, December 2nd from 6-9PM. Don't miss this vibrant, joyful exhibit! Who is That Man with the Outstretched Hand? 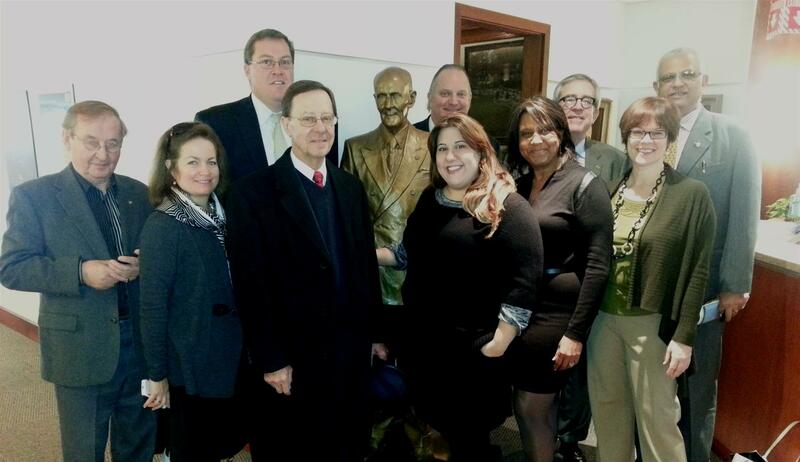 This bronze gentleman currently resides in Evanston, Illinois, at the headquarters of Rotary International. He's reaching out to visitors as he reached out to potential Rotary members, first in Chicago in 1905, and then throughout the country and the world in later decades. Today we were entertained and enlightened on the man and his legacy by Walter Reed, Chair of Rotary International Foundation Annual Giving. Mr. Reed gave us a great talk on the purpose and history of the Paul Harris Fellowships. These commemorate Rotary members who have given $1,000 or more to this particular foundation, chiefly (but not exclusively) known as the source of the Ambassadorial Scholarship Grant program. These scholarships grew out of the great financial outpouring after Mr. Harris' death in 1947. 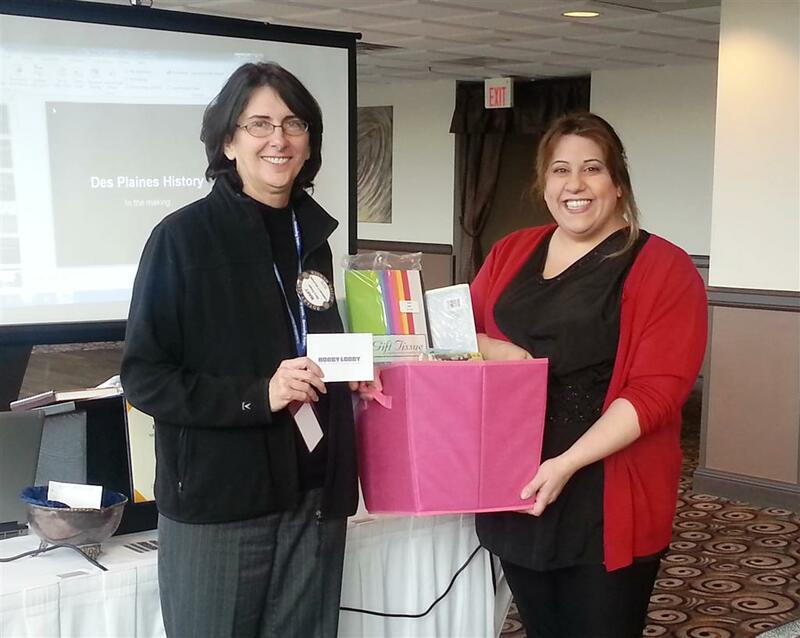 Did you know we have ten Paul Harris Fellows in the Des Plaines Club? You'll notice they have been generous with their time, energy and leadership as well as their money. "Any victory would be dear at such a price." So spoke General Robert E. Lee on the death of Thomas "Stonewall" Jackson. City Attorney David Wiltse has a not-so-secret passion for Civil War history. He comes by it honestly; he is the descendant of two Civil War soldiers. James Wiltse (15th New York Heavy Artillery) and Luis Keck (45th New York Infantry) joined our Rotary lunch last week, at least in spirit. In full uniform, Dave gave a riveting - and occasionally startling! - talk on the battalions and weaponry of the war, passing around lead shot and bayonets. Do you think Denny looks a little nervous? We are so fortunate to have in our club members who regularly connect our suburb with a global community. 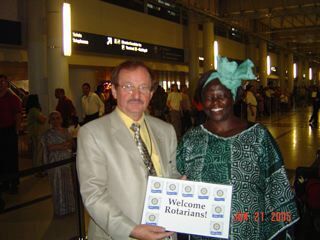 In 2005, Werner had the honor of welcoming (at O'Hare Airport) Madame Wangari Matthai of Kenya, Nobel Peace Prize winner, and keynote speaker of the Rotary Centennial Convention in Chicago. Madame Mathai recently passed away from cancer, but this photo is one of Werner's fondest Rotary memories. Note that the sign he is holding now graces our weekly meeting at the Golf Center! We were delighted to welcome Werner back at lunch last week, recovering nicely from his heart surgery. "It's quite different than a balloon or an airplane. It feels almost like parasailing. Sitting and walking around in a comfortable cabin with a 360 degree spectacular view of the landscape below, adds to the thrills of flying. " That's Lars Pentzak of Berlin piloting the 246 foot long Farmer's aircraft. 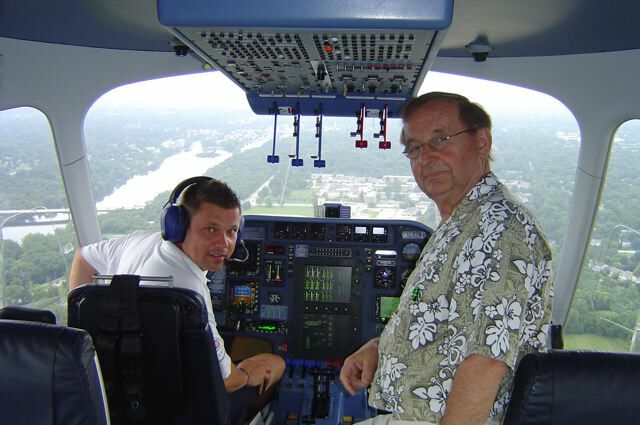 It operates out of San Diego, California, though Lars and Werner were looking down at the Rock River near Elgin, Illinois. I grew up in Akron, famous for the Goodyear Aerodrome and its flotilla of smaller blimps, but I never went up in one. Werner lives life to the fullest! 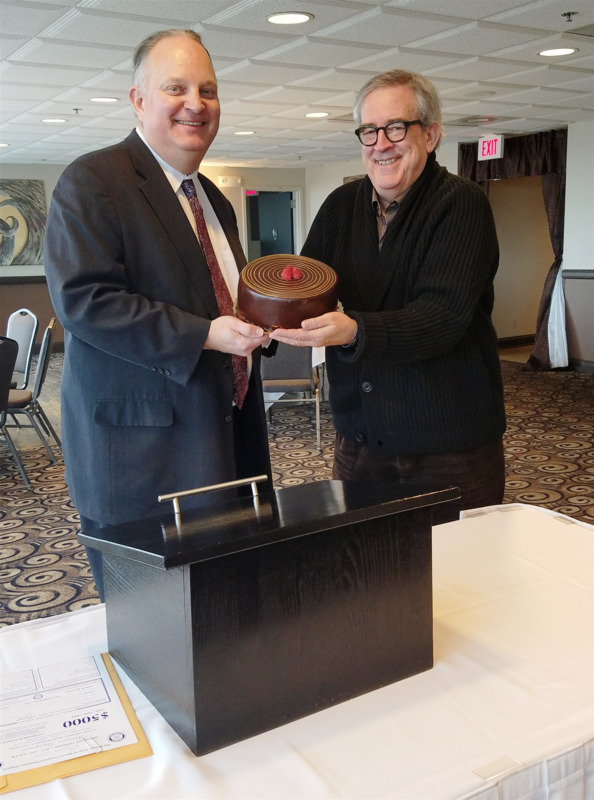 Des Plaines Rotarians are still licking their fingers after a visit from David Levine of Illinois Nut and Candy, based in Skokie, Illinois. David bought the business a decade ago, and has been transforming the world of corporate gift-giving ever since. Need two dozen scale model Jaguar XKs in dark chocolate to use as centerpieces? David Levine is your man. Chocolate "thank yous" in a dozen languages? Call 1-800-590-NUTS. Thanks, David, for satisfying our sweet tooth and our need for enthusiasm and inspiration! Do you know a young(er) person who is eager to travel? Do they make friends easily? Do they have an instinct to extend a hand to a stranger? Are they a college grad or expectng to graduate in the next year? 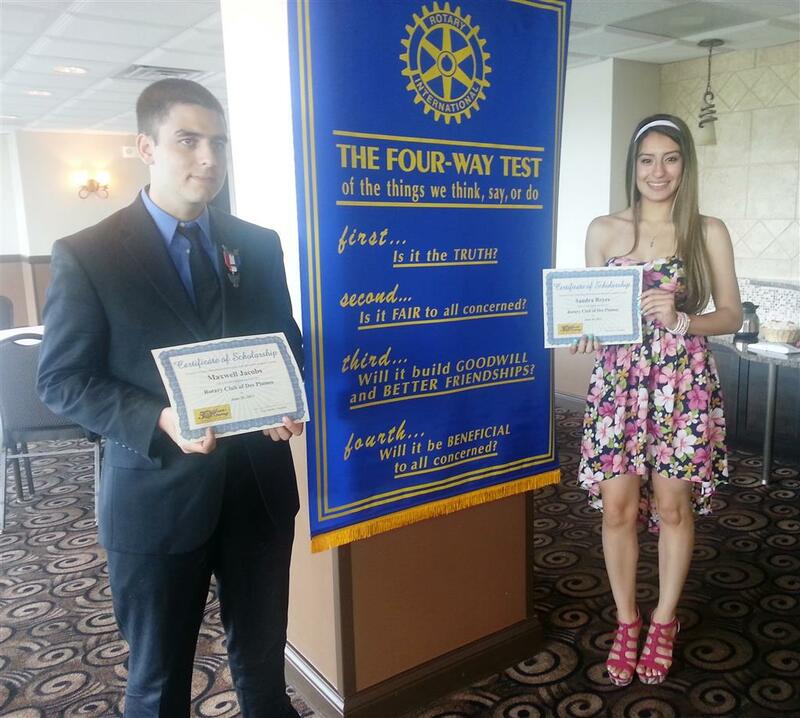 They sound perfect for the Rotary Ambassadorial Scholarship! The deadline has passed for 2011, but this scholarship is offered every year, so keep it in mind! The Ambassadorial Scholarship is intended to further international understanding and friendly relations among peoples of different countries. Those selected become "Ambassadors of Good Will" and make presentations before, during and after the award year. Scholarships are for graduate study for one academic year (nine or ten months). The 2010 award was $27,000 per person! For all the details, click HERE. It's a great opportunity, and I bet you know someone who'd be just right. 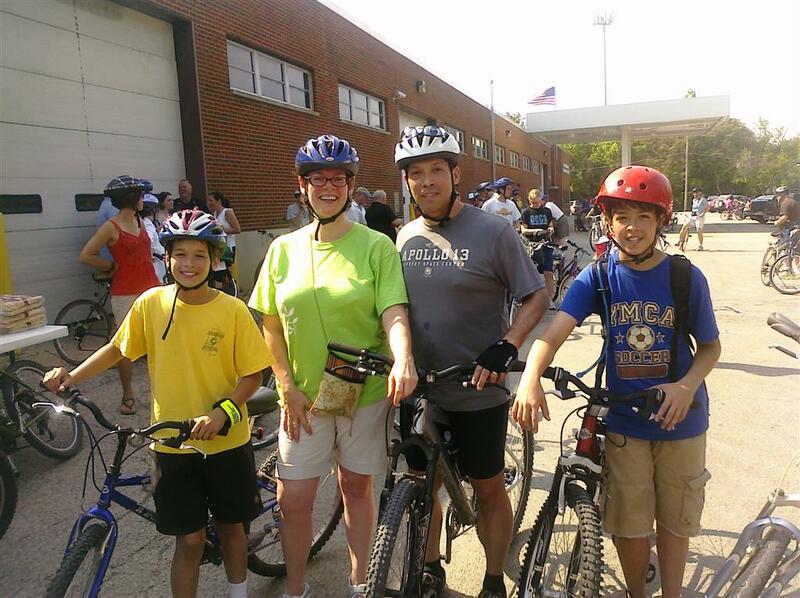 Spotted at the Des Plaines Bike Trail kickoff event were David Rodriguez, his handsome sons Ethan and Cameron, and Roberta Johnson. We rode nine miles with over 200 other riders to celebrate the newly refurbished bike trail between Miner and Touhy. 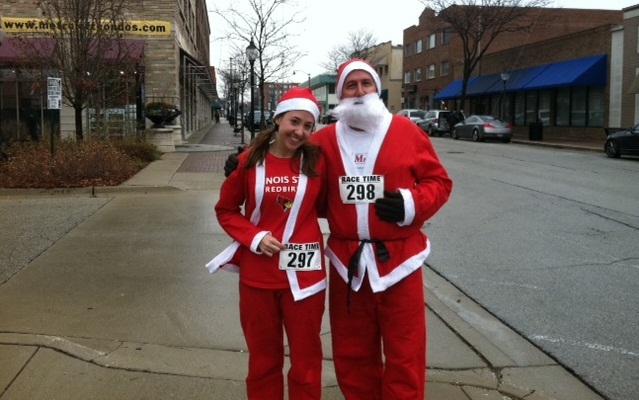 Thanks to Mayor Moylan, the Des Plaines Police Department, and Mother Nature for a fantastic morning! 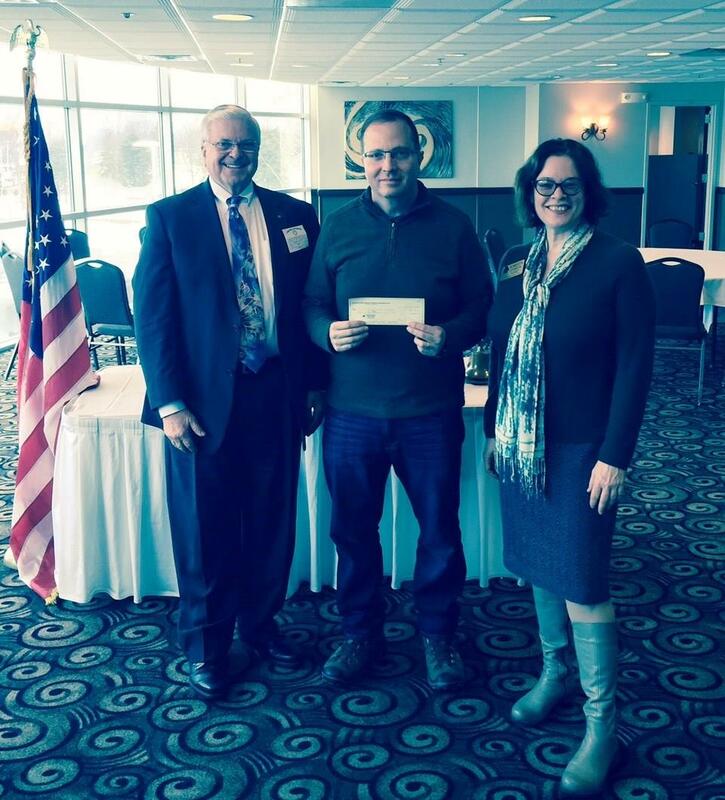 The Des Plaines Rotary Club has made a generous donation to the Self Help Closet & Pantry of Des Plaines. We presented a check for $500.00 to help the many families that utilize the service of the pantry. What a great way to start the holiday season. On November 21st we come out to help serve lunch at the Frisbie Senior Center, we were so pleased and touched by the participation of several other Rotary Clubs. We want to thank everyone that came to help out. Happy Holidays! The Rotary Club of Des Plaines presented a check for $250 on January 8 to the Veteran's of Foreign Wars Post in Des Plaines, IL for the Honor Flight Chicago Program. Des Plaines City Manager Jason Bajor and Assistant City Manager Jason Slowinski were installed into the Club on Thursday January 8, 2009 by Club President John Hecker.